This morning we took a boat tour on the Yellow River. Just upstream from the boat landing, there was a rope stretched across the river suspended by styrofoam floats, perhaps ten inches in diameter. The purpose of the barrier was allegedly to prevent the transit of fishing boats that might spread some specie or other of noxious immigrant weed but our guide instructed us to inspect the floats themselves as we drifted by. The park guides call these “bite buoys” and indeed, every float was thoroughly punctured by dozens and dozens of teeth marks. 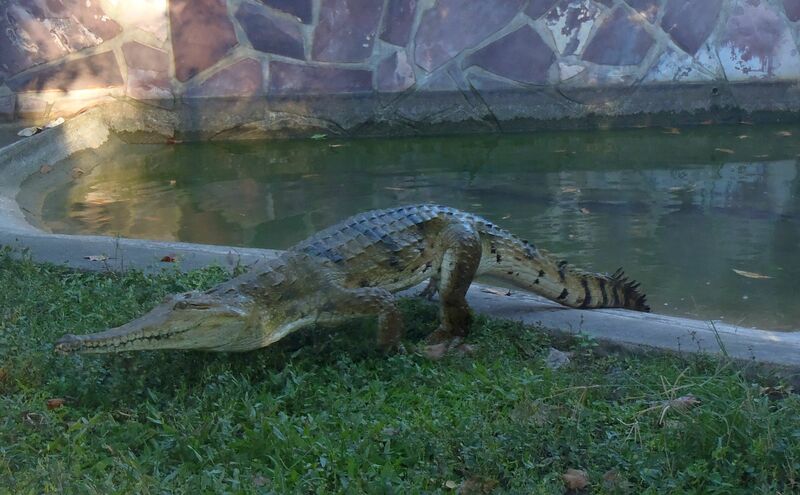 We were told that crocodiles are naturally curious and “test bite” objects such as the bite buoys, to see if they are edible. 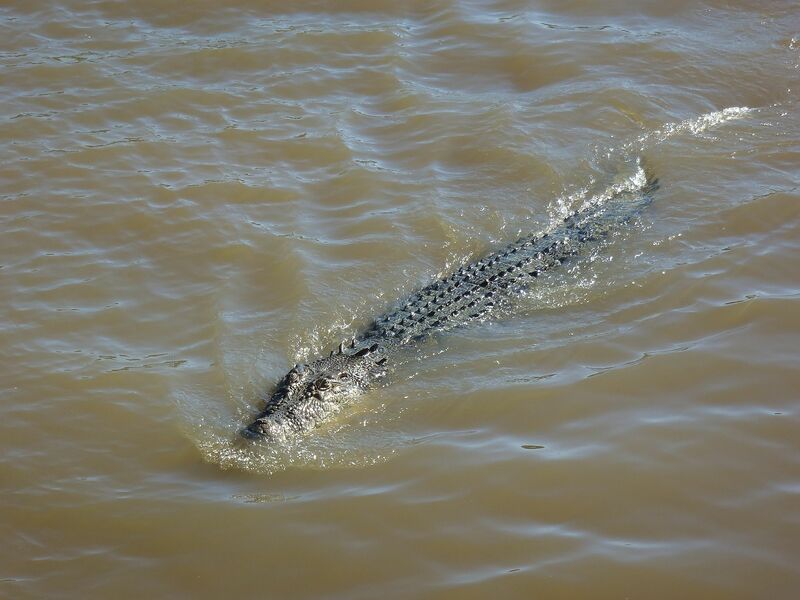 The rangers will monitor an area of billabong for crocodiles by seeding it with an unchewed bite buoy, that has been soaked in fish oil. When the buoy is checked later, the presence of teeth marks indicates the presence of crocodiles. Of course it occurs to me that this is not a fail-safe system, in that the absence of teeth marks does not guarantee the absence of crocs. Nevertheless we were impressed with the quantity of puncture wounds in the thirty or so buoys we viewed. We saw a large crocodile swimming across the billabong on the other side of this barrier but that was not our tour direction. 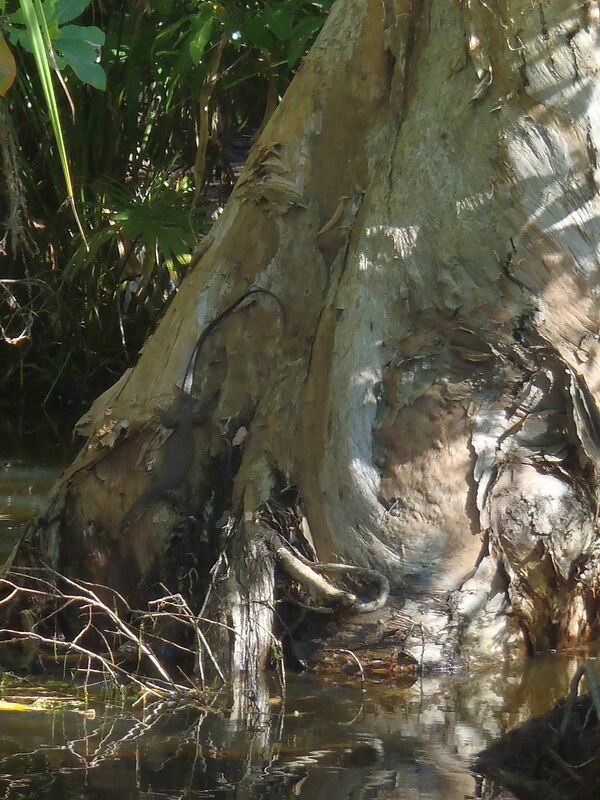 The water in the billabong was smooth as glass and mirrored the jungle of tree roots and drooping branches. Our tour boat was a shallow draft pontoon and its path twisted and turned inside the maze of tree stumps and mud banks. The water level has been falling daily, since the flooding a few weeks ago and the river tour has had to adjust its route accordingly, with the new depths and exposure of new obstacles. At one shallow spot we saw a crocodile in our path but it sank slowly as we approached and we lost sight of it, even though the water depth was only about two feet. 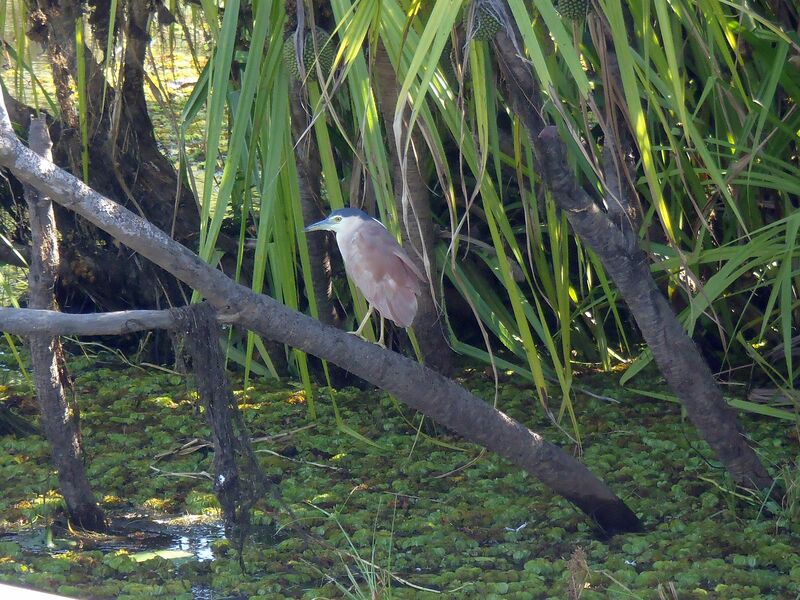 The bird life was amazing, we watched an osprey hunting, magpie geese, kingfishers, bee-eaters and many more too swift to identify, flitting across the billabong. 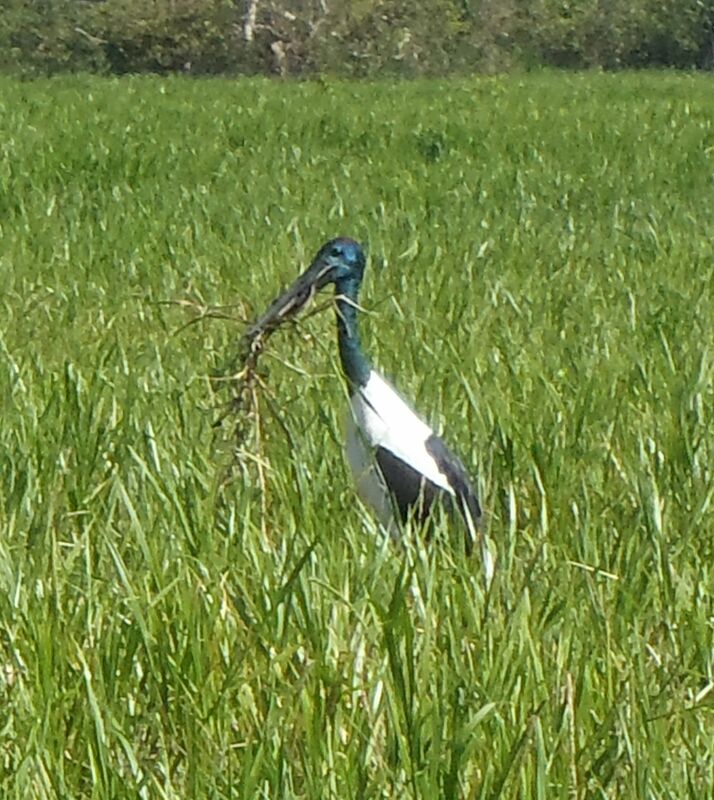 We saw a large monitor lizard climbing the very tree where the ospreys were nesting - which showed either amazing nonchalance in going after the ospreys’ eggs, or amazing stupidity if it was spotted doing so. 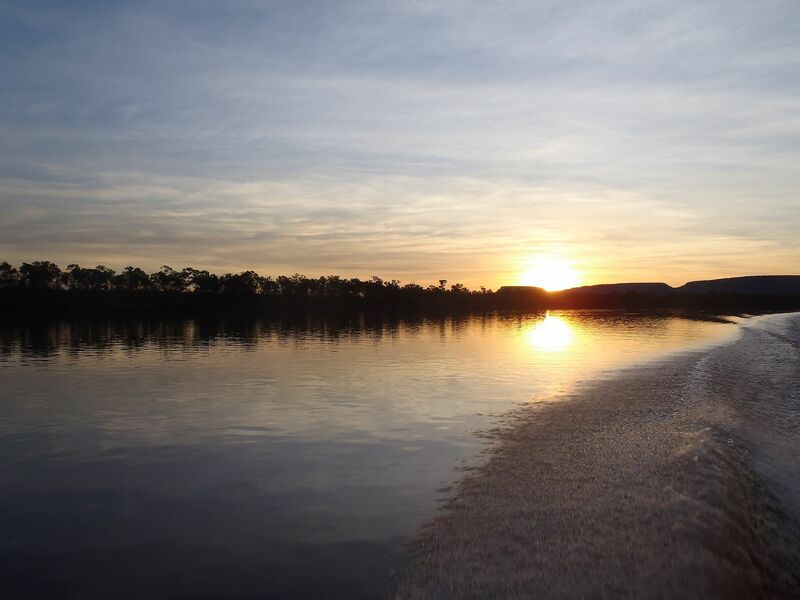 We saw three more crocs as we motored slowly along the Alligator River – badly misnamed as Australia doesn’t have alligators - as well as vast floating mats of buffalo grass. This was an excellent tour affording us an appreciation of the different environments that span the the park. 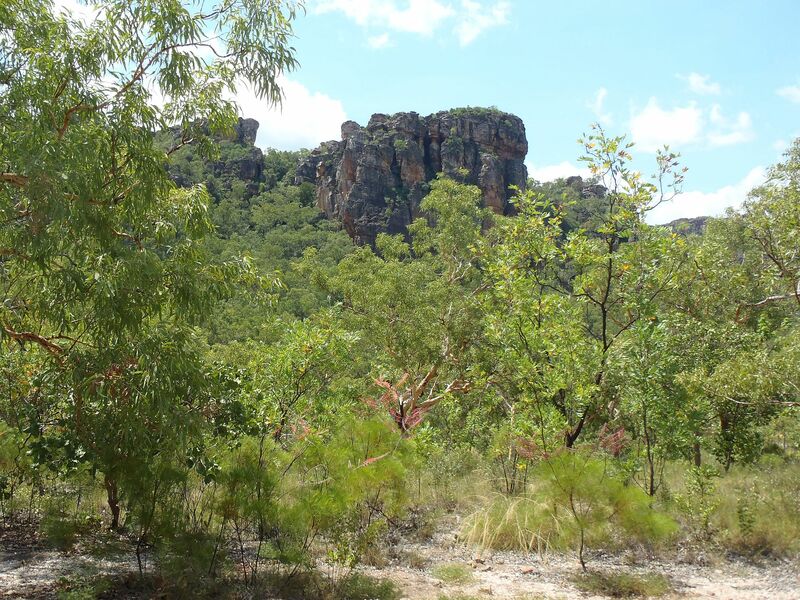 We next drove to the site of Nourlangie and hiked up to the cliff face of an escarpment. 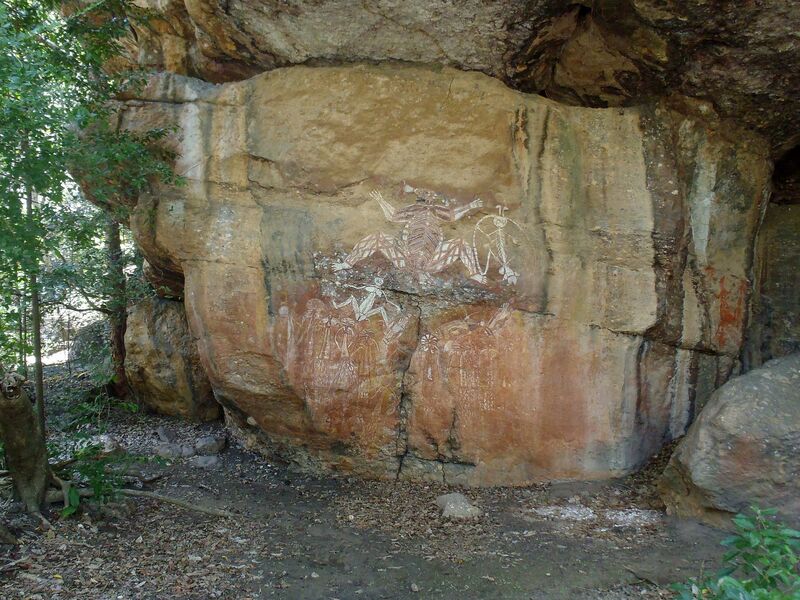 Large blocks of rock had fallen from the face of the escarpment and some leaning, formed natural shelters from the elements for visiting hunter / gatherer aboriginal tribes. 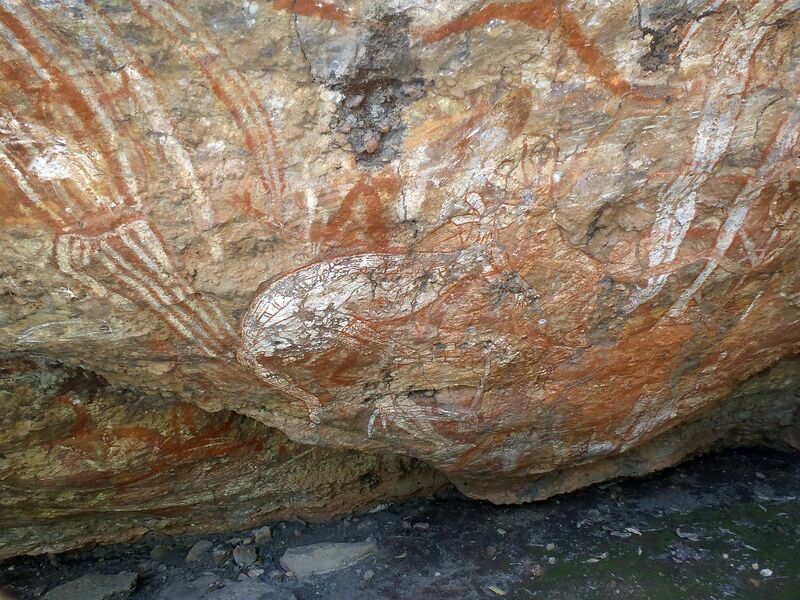 The shelters were also the site of ancient rock paintings and again, we were impressed at the detail of these images of fish, kangaroos, turtles and human or spirit forms. 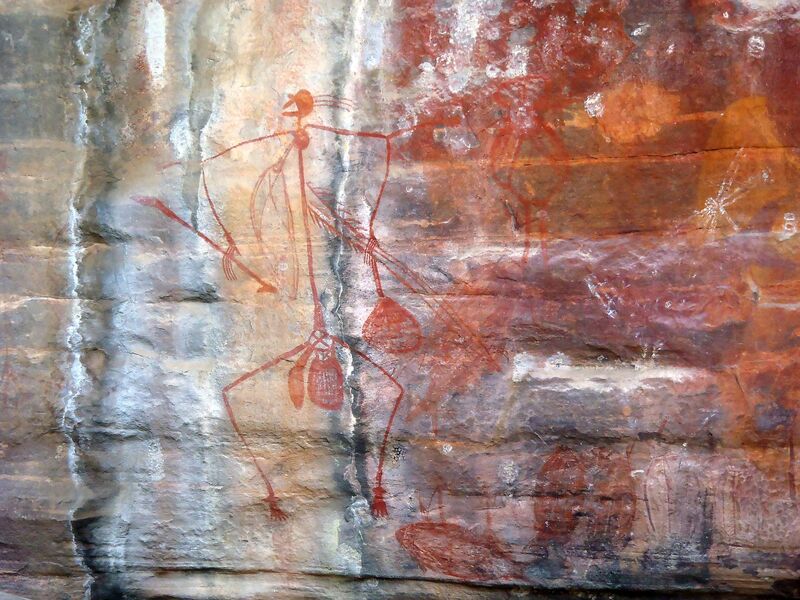 The artists had utilized different pigments in their work, ranging from ochres through earth reds and the results retain a three dimensionality that I have always found absent in North American aboriginal art. 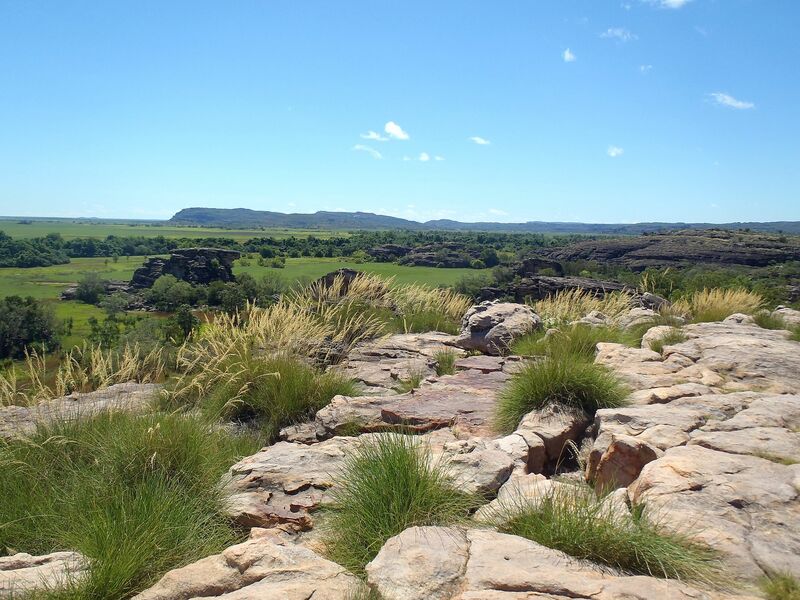 Later, at the Bowali visitor center, we were told that the road to the aboriginal rock art sites at Ubirr had 400 mm of water at the two river crossings. 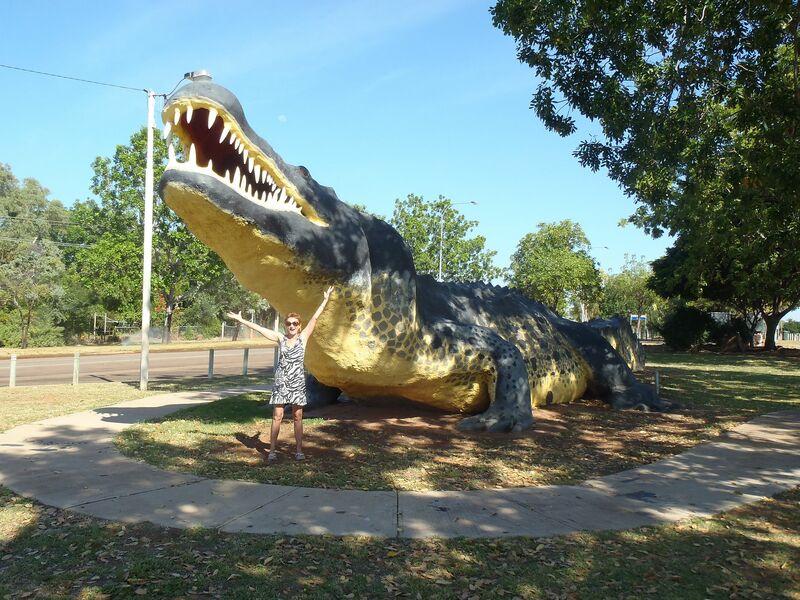 We decided to spend the night at Kakadu Lodge Caravan Park in Jabiru and tackle the flooded road on the morrow. 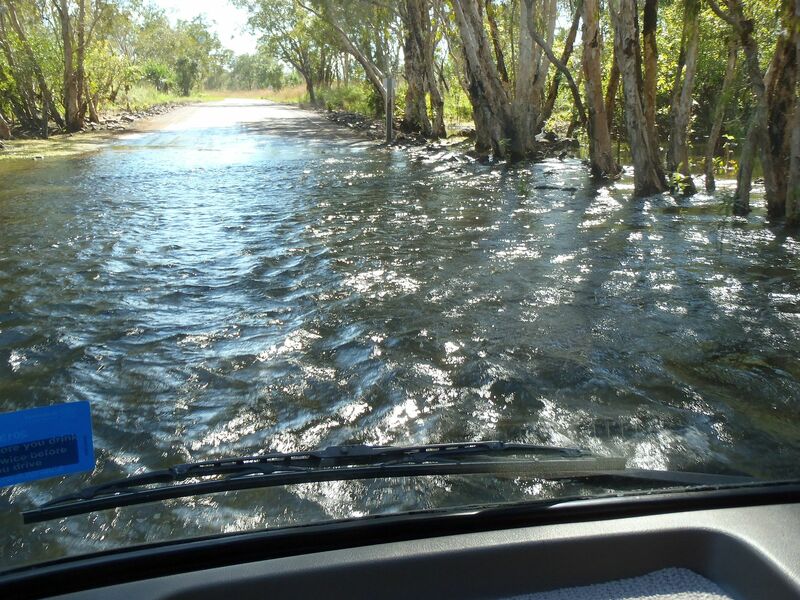 We checked with the caravan park office as we drove out and sure enough, the two flood crossings on the road to Ubirr had reported depths of 200 mm. (8 inches). Nevertheless, when we approached the two crossings, we drove slowly and carefully. Although diesel engines don’t have electronics that can be easily shorted by water, the bus’ air conditioner condenser is very low on the right side of the body and for us, the loss of air-conditioning would be almost as traumatic as a stalled engine in the middle of a crocodile filled river. 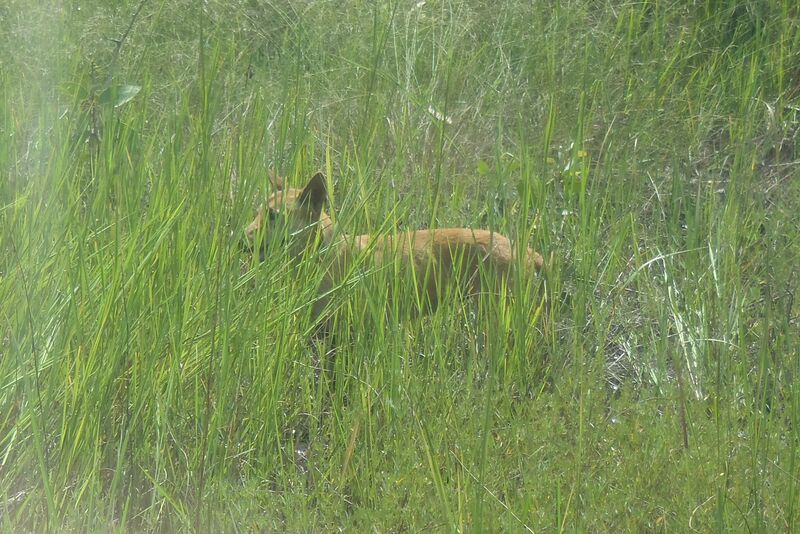 Another great hike at Ubirr. 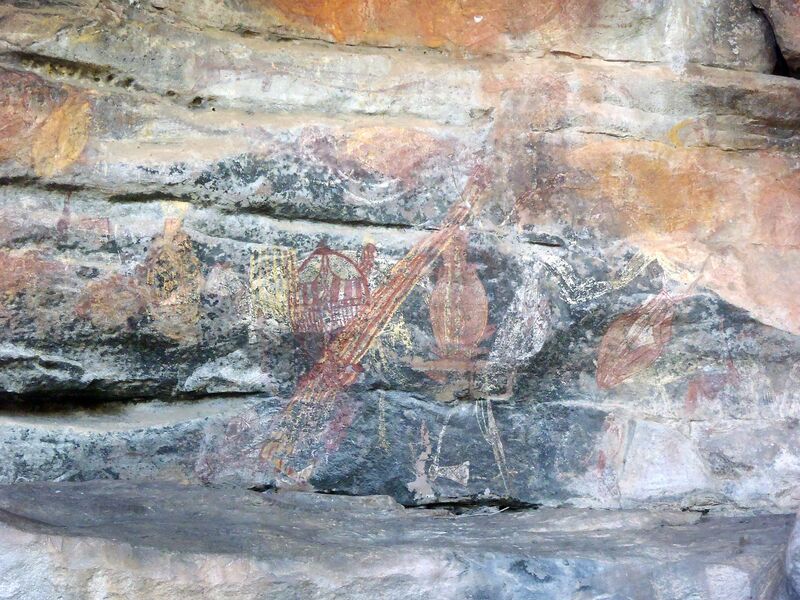 There were few other tourists and the overhanging roofs of the natural rock shelters provided shade as we examined the many ancient paintings. 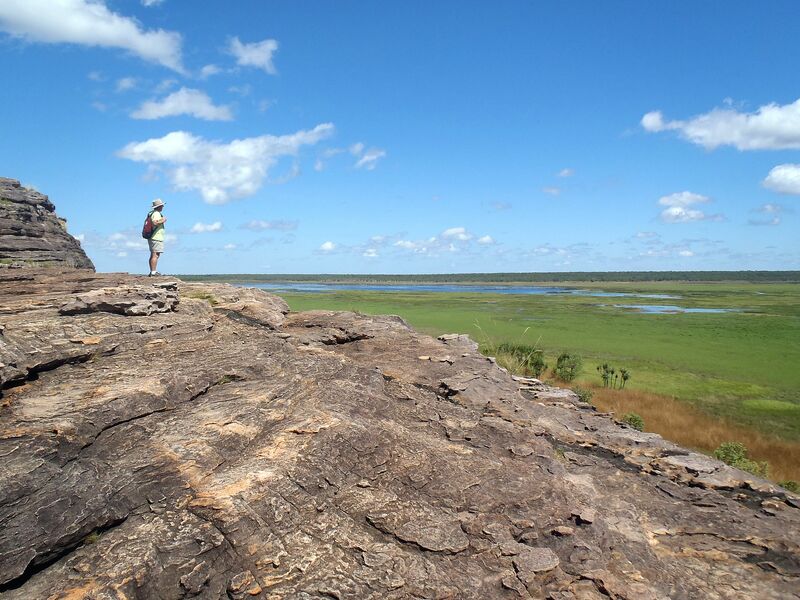 The Ubirr site also has great lookouts from the top of the escarpment, that were used as shooting locations in the Crocodile Dundee movies. We chatted to a park ranger about the problem of feral cats. During our drive across the Savannah route from Burketown, we had spotted three cats, hundreds of kilometers from each other and human habitation. The cats had run from us, when we slowed, providing the clue that these were feral. What had puzzled us was how domestic cats could survive in such an arid climate and since they were obviously successful predators, what gap in the predator / prey hierarchy of Australian wildlife they had filled? The ranger was very knowledgeable on the problem and indeed feral cats have become a huge problem, wiping out entire species of small marsupials and ground dwelling birds. He explained that the government had run out of funds allocated to their control. When I suggested that they simply charge hunters a fee to hunt unlimited numbers and actually make money in the process, he explained that the Northern Territories government doesn’t trust local hunters not to shoot everything else on sight but that New South Wales was currently testing the concept. 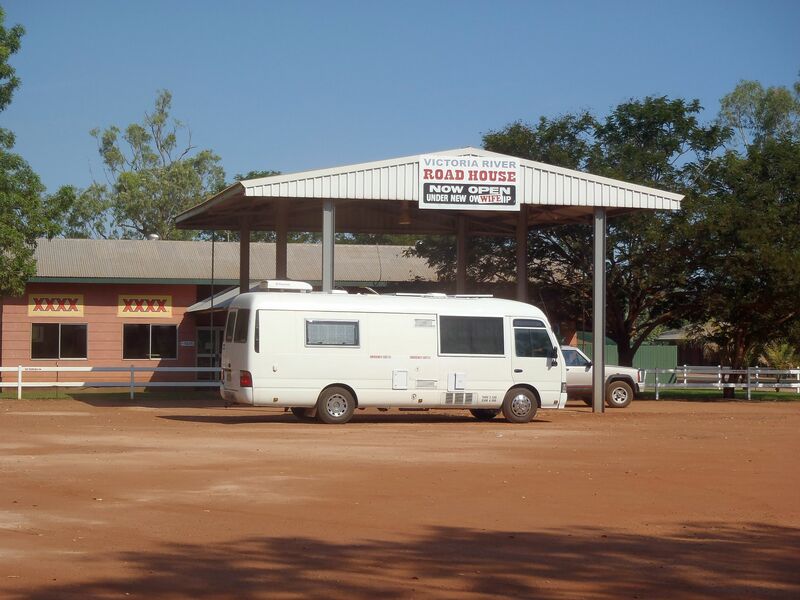 Later that afternoon we drove towards the Adelaide River on the road to Darwin and stopped for the night at the Corroboree Park Tavern. 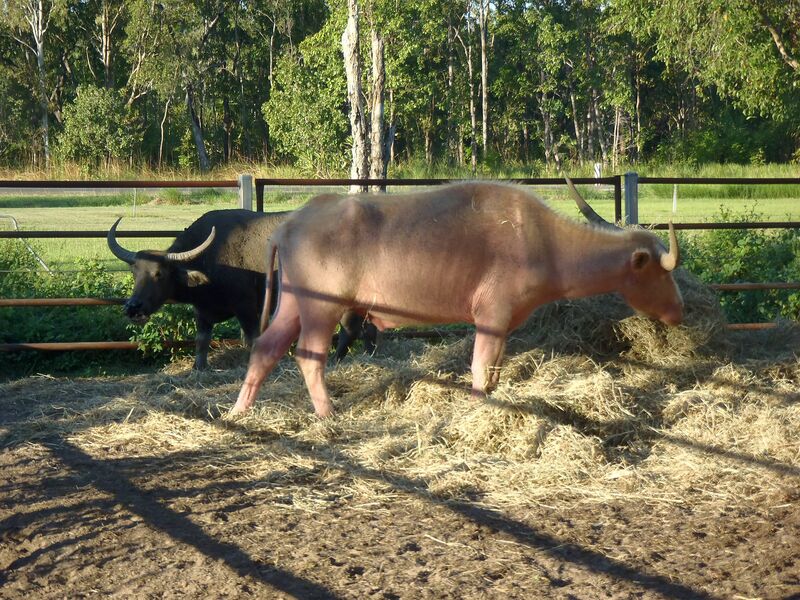 The park had several paddocks at the entrance and displayed an albino buffalo as well as a freshwater crocodile and a five meter salt water crocodile. The latter seemed to be separated from the tourists by a screen of chicken wire that already showed signs of several crude patched repairs. The croc eyed us coldly and I remembered that it was not scheduled to be fed until tomorrow. 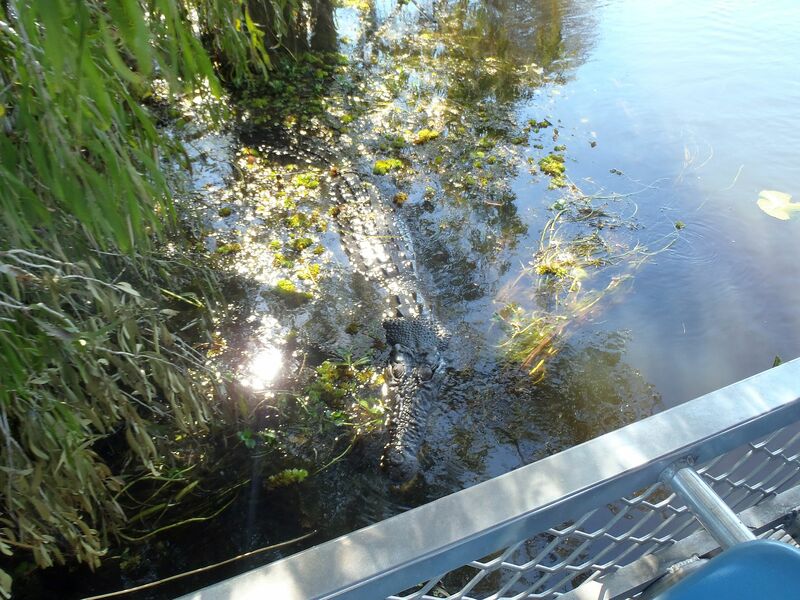 This morning we buzzed over to the Adelaide River to take one of their famous “Jumping Crocodile” tours. We had heard someone complain bitterly that he wouldn’t ever support such a tour, because it “teaches” the crocs to jump and they are therefore “trained” to approach some innocent fisherman’s boat and jump into the midst of bait, tackle, beer and potato chips. 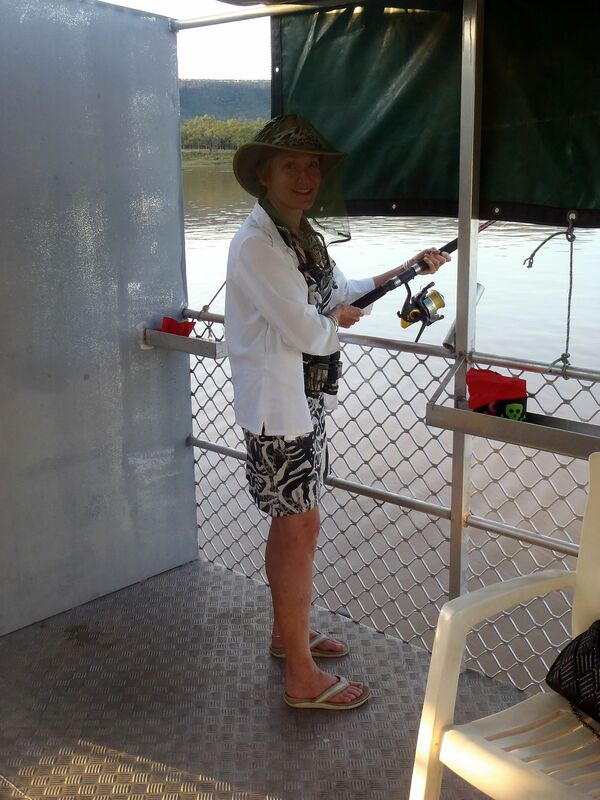 Well apart from the fact of wondering why any fool would fish on the Adelaide river in the first place, which is simply teeming with crocs, you learn that crocodile jumping is not a learned phenomenon. They do this naturally as part of their hunting behavior, in that they take birds, mammals, snakes or anything else they can get, from low overhanging branches. 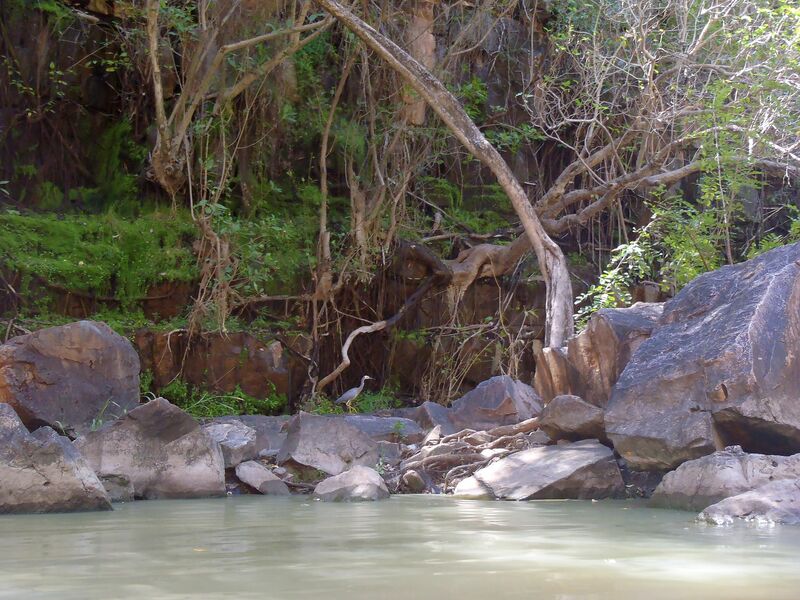 The Adelaide River is home sweet home to thousands of crocodiles but the little darlings are fiercely territorial and a dominant male will patrol his section of the river, offering combat to all male interlopers and any female that interferes with his feeding. 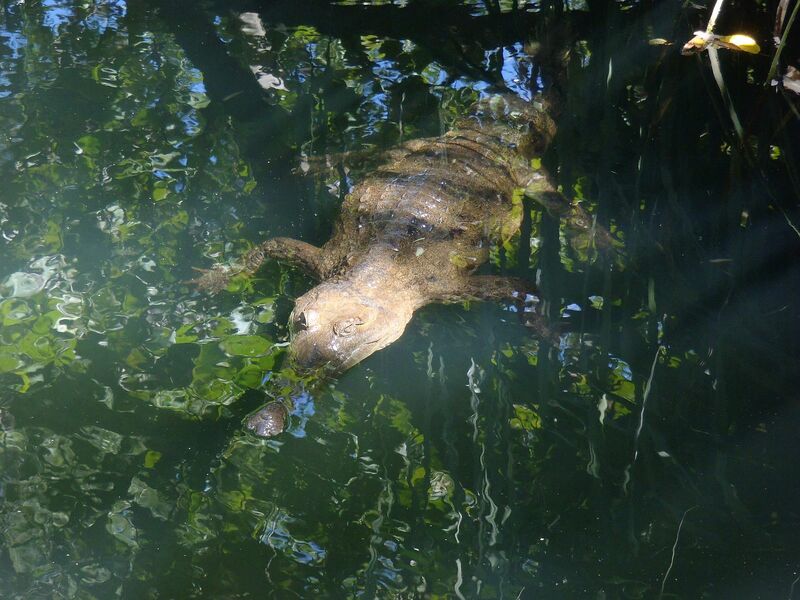 Thus there are perhaps a dozen or so crocodiles that automatically approach tour boats expecting to be fed and the tour operators have even named them. Even if the foregoing was not true, I would still take a politically incorrect tour because it is fun and furthermore, I’m not the fool in the “tinnie” with the bait and potato chips. In fact we loved this tour boat. It was a big double decker, with the lower deck windows glassed in. 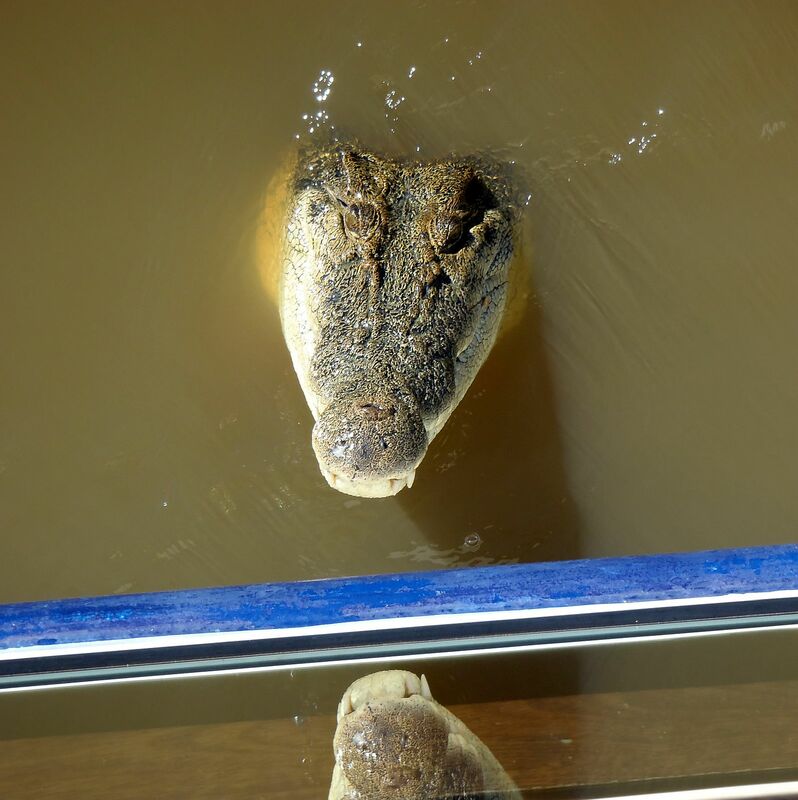 The tour guide mentioned that the government required “abandon ship” practices on a routine basis, in case of accident and that crocodiles typically attacked the “Carley floats” within forty seconds of their launch. As before, this was a fun tour and we marveled at the crocodiles who thrust themselves vertically out of the water, a distance of half of their body length, to take the proffered pork chop. Our guide also threw morsels of meat in the air for the circling kites and these birds would either catch the tidbit in the air and proceed to eat it on the wing, or grab the meat from the water with their talons. Cool! Annette showed the park guides the crocodile tooth she had purchased in Cairns and the guides estimated that it was derived from a five meter crocodile and therefore quite rare. We motored onwards to downtown Darwin, found a parking spot with some difficulty but soon located the art gallery where we had purchased paintings in 2006 (www.aaia.com.au). 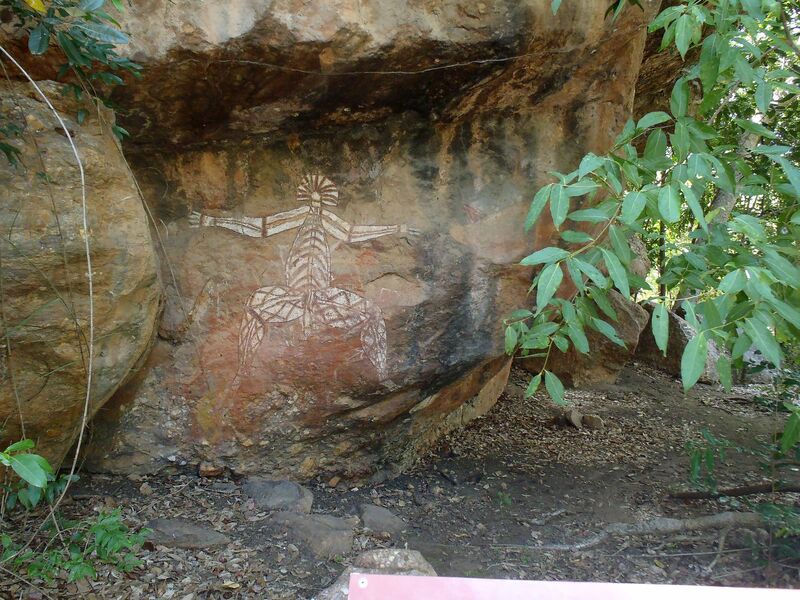 The gallery specializes in “fine” aboriginal art and bore a “going out of business” sign. 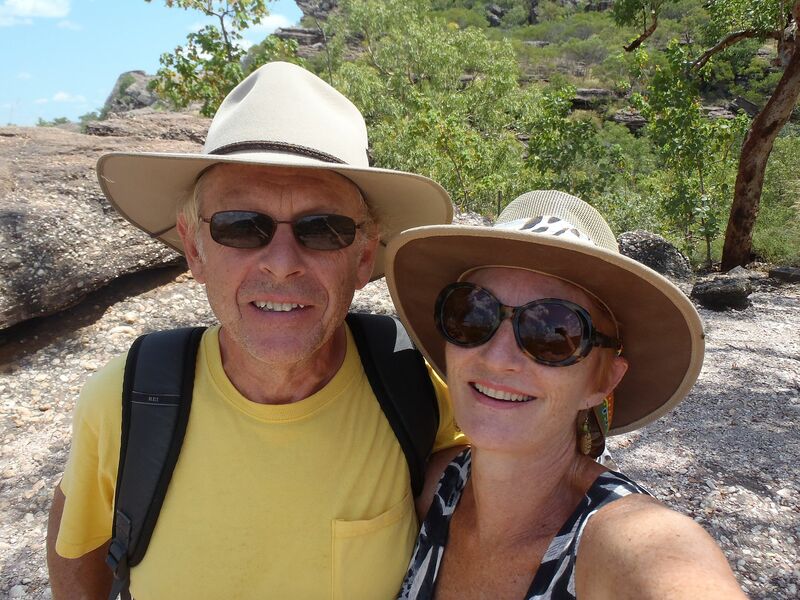 The proprietor indicated that tourism is way down and that real estate prices in Darwin have soared due to the shortage of real estate for sale, combined with a recent increase in the number of workers in the mining industries looking for accommodation. This reminded me of the phenomenon we had witnessed of an extraordinary number of “four trailer road trains”, heading east across the Arnhem Highway as we drove west. 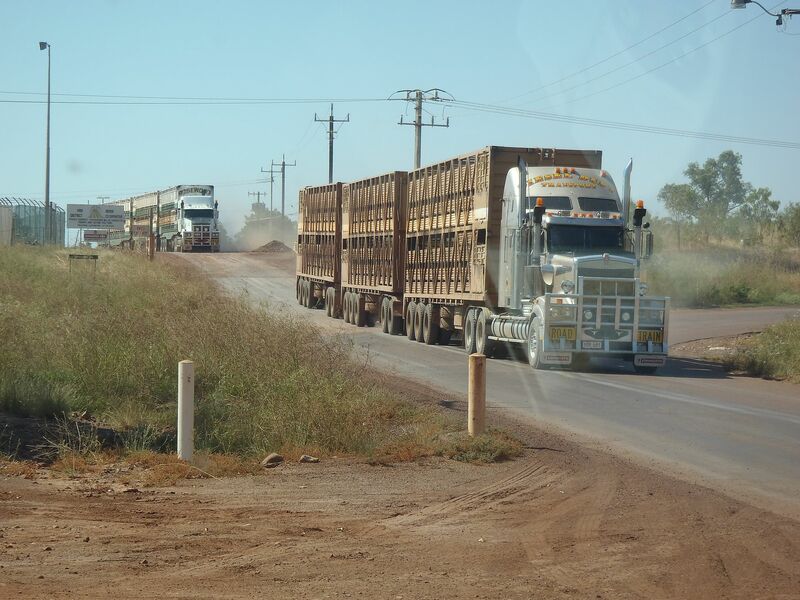 We had presumed that they haul ore outbound and fuel inbound for the uranium ore mines in Arnhem land. I don’t know the average price of real estate in Darwin but a quick Google search indicated that the average price of a family home in Australia’s large cities is around $500,000. The locals can’t afford the rent increases and are moving out and the miners aren’t buying art. The gallery had hundreds of pieces of art for sale but much of the modern work appears to my eyes as “two six packs” art. 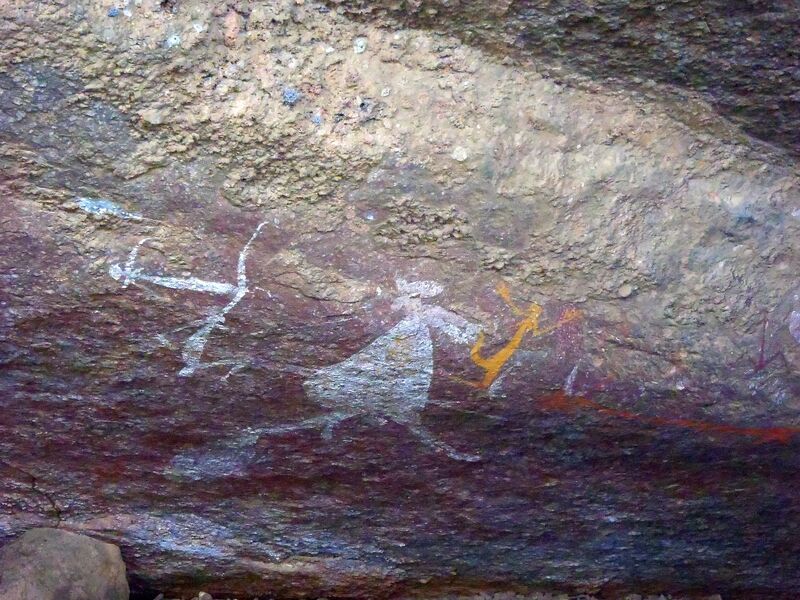 Whereas traditionally aboriginal artists might have worked months on a piece, in recent times it looked as though the length of time the artist had invested was about as long as it took to consume two six packs. Nevertheless, this gallery still shows some very good work although it tends to be the older pieces. We spent three days visiting Darwin and began by visiting the East Point Military museum, located around a WW II fortress on the point of land to the north-east of the city. The museum had some great collections of weapons including a Bren-gun (light machine gun) that I have always wanted to own. You can legally own functional machine-guns in the United States, with the appropriate permit but somehow, there doesn’t seem to be a way to legally own a Bren-gun, working or not. They also had a Bren-gun carrier, a light tracked vehicle and I learned that after the cessation of hostilities, hundreds of these vehicles had been sold to local farmers (without the machine gun) as surplus. The best exhibit was of a 9.6 inch gun that was mounted and which sat in the concrete bunker, guarding Darwin from the battleships that never came. It stands as a monument to the ability of the professional military to prepare to fight the previous war. The Japanese attacked with four aircraft carriers, plus land based bombers, for which Darwin was wholly unprepared in February of 1942. The 9.6 inch guns were delivered around 1944 / 1945 and fired but three test rounds. After the war and in an act of irony, they were cut up for scrap and hauled away by a Japanese salvage company. I had read this and was therefore a little surprised to see a 9.6 inch gun still in place. Upon examination, I realized that it was in fact a very well executed wooden mock-up of the real thing. We could have used one of these aboard DoodleBug when we sailed her through pirate territory. We next visited the Australian Aviation Heritage Center, where there is an extensive display of aircraft including one of only two B-52 strategic bombers outside of the US mainland. Annette lived on Guam during the mid-60’s and remembers the constant take off and return of these huge machines, that at the time, were being used against North Vietnam. This museum had a poem painted on the wall, next to the Men’s toilets and the poem was titled “Bloody Darwin”. It was a soldier’s diatribe against this far flung outpost and reminded us of the hardship of living here under primitive war-time conditions. As far as I am concerned, the worst of these hardships was that beer was strictly rationed to two bottles per man per week. Bummer! 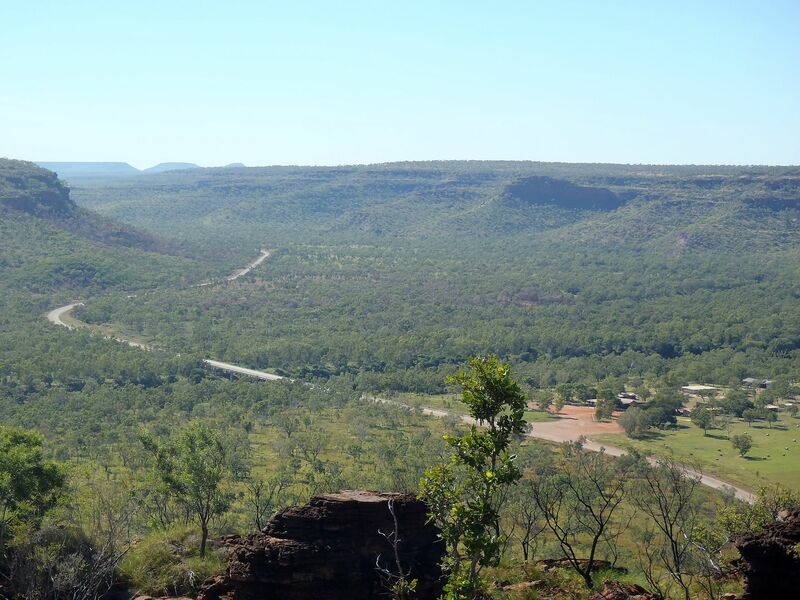 The Darwin underground oil storage tanks were completed long after they were needed and were never used. Construction of the tunnels was begun shortly after the February 1942 raid, when Japanese warplanes had utterly destroyed the original storage tanks. At the time, the tanks had been grouped together in neat military precision and painted white. The working conditions for the poor souls digging these tunnels with pickaxes and shovels in the heat and humidity of Darwin, can only be imagined. The Art and Cultural Museum is always a good stop because it is both air-conditioned and free. Seriously, there are excellent displays of aboriginal artifacts, art, a great audio visual display of the 1974 cyclone that devastated Darwin and a very interesting display of predominantly wooden ships from the sub-Asian maritime nations bordering Australia’s north. Several of these vessels had been confiscated by Australian authorities for smuggling refugees or illegal fishing and some had been in legitimate commerce, such as a Pearling Lugger. During our travels, we had seen ships like these at sea, under sail and under power and marveled at the age and seaworthiness of the designs. Westward bound again! 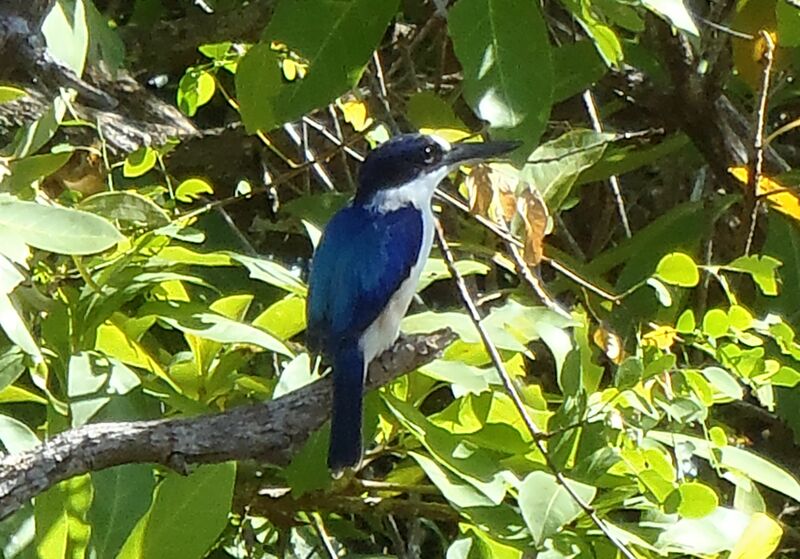 We set out on the Berry Springs road for Litchfield National Park. This road was unsealed for thirty plus kilometers and we drove on it, just long enough to get the bus thoroughly dirty, before entering the National Park. 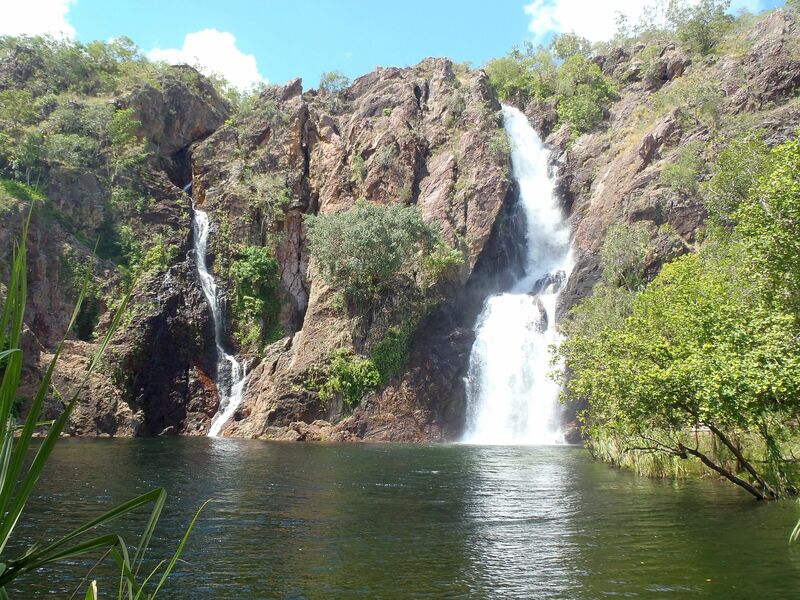 Many of the access roads to waterfalls or overlooks were closed but one of the most visited sites, Wangi Falls, was open. 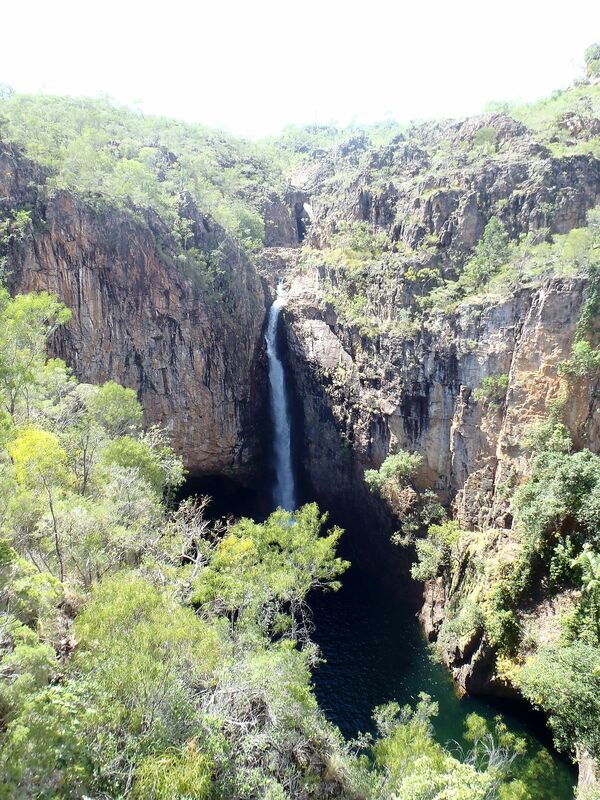 There were two spectacular cascades, pouring from a cleft in the reddish rock and plunging into a clear pool below. 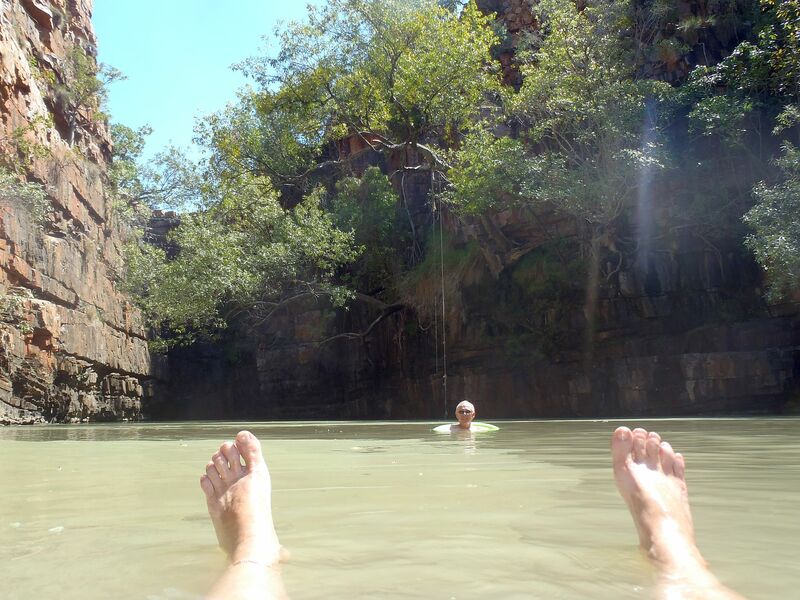 Supposedly, this is a popular swimming hole but there was no cooling swim to be had, because of the crocodile risk. I can imagine crocodiles swimming miles up tidal rivers but have a real problem imagining them bounding up the various waterfalls like salmon. However, one has to suppose that the Australians do understand their wildlife better than us tourists. We spent the night at the nearby Litchfield Safari Camp and spent the afternoon with a couple of beers, soaking in what appeared to be a stock tank. Naturally the mosquitoes found us but since we had only our heads exposed, we smashed or drowned the first eight or so and the word must have gotten out because they left us alone for the balance of our float. This morning I armed Annette with a large can of bug spray before she left the safety of the RV to use the camp potty. 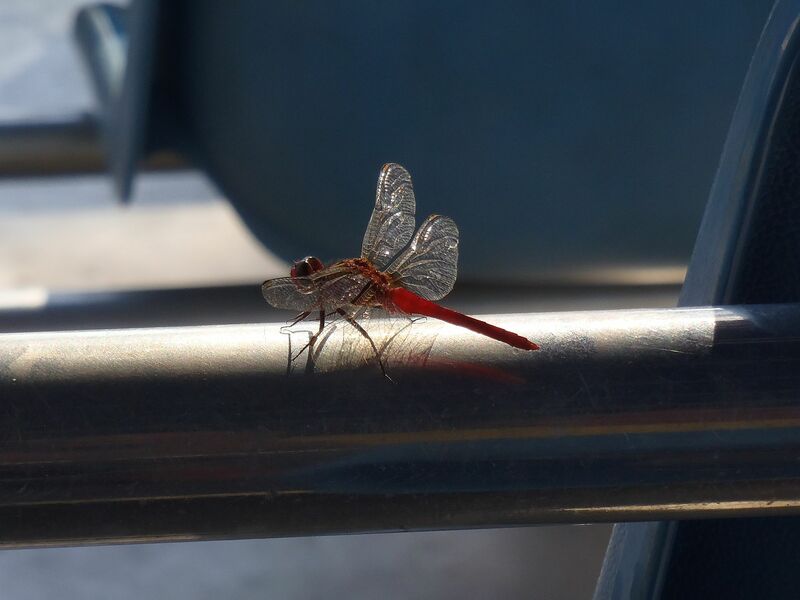 Sure enough, the toilet stall was swarming with mosquitos and she liberally sprayed them before ascending the throne. She looked up later than she should, because like Little Miss Muffet, there was a huge spider directly above her, choking on the residual bug spray. Not the relaxing, gratifying experience she had planned. We decided to move on. We planned on hiking about 2.7 kms at Greenant Creek to visit the falls above but a warning sign advised us to wear clothing covering our arms and legs, to liberally dose any exposed skin with “deet” and then ran down a list of all of the awful tropical diseases we were going to expose ourselves to. Not! 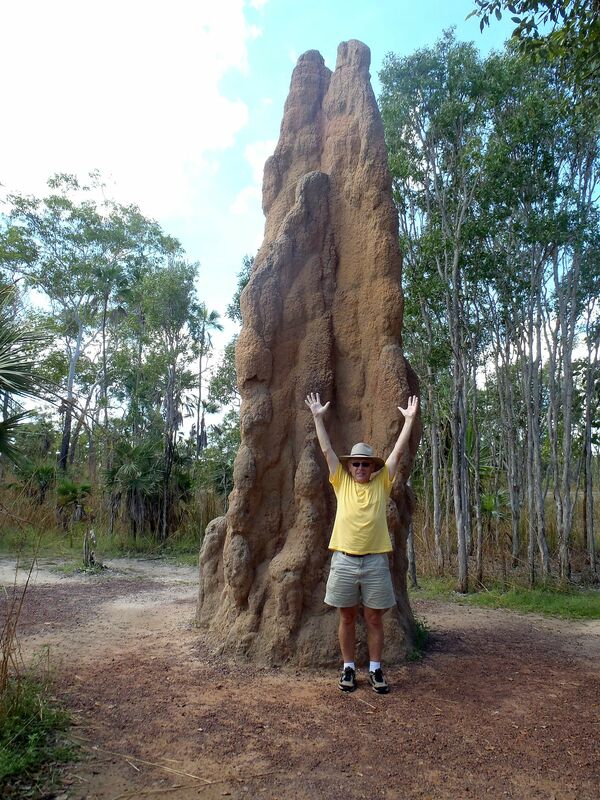 We had the recommended clothing available but it was already hot, thus we decided to blow this one off and headed over to see the termite mounds. These were interesting in that at the site we visited, there were two different varieties of termites in proximity to each other. One breed created “cathedral mounds”, sixteen foot tall structures of adobe colored concrete, built upon on dry soil. 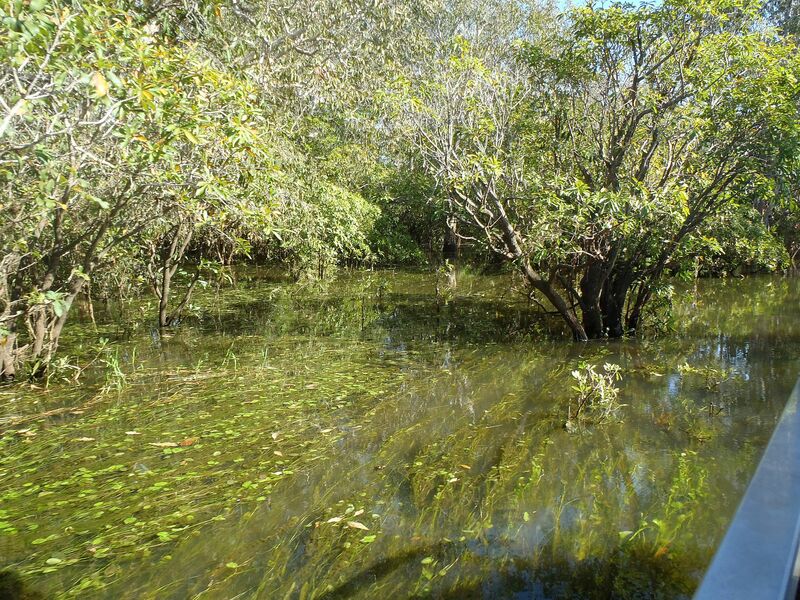 The other breed favored the adjacent wetlands and were the so called “magnetic” mounds. The mounds were dark grey colored, perhaps around eight feet tall but flat and thin and with a north south orientation. The thinness and orientation are supposedly for temperature control within the structure, influenced by solar heating. 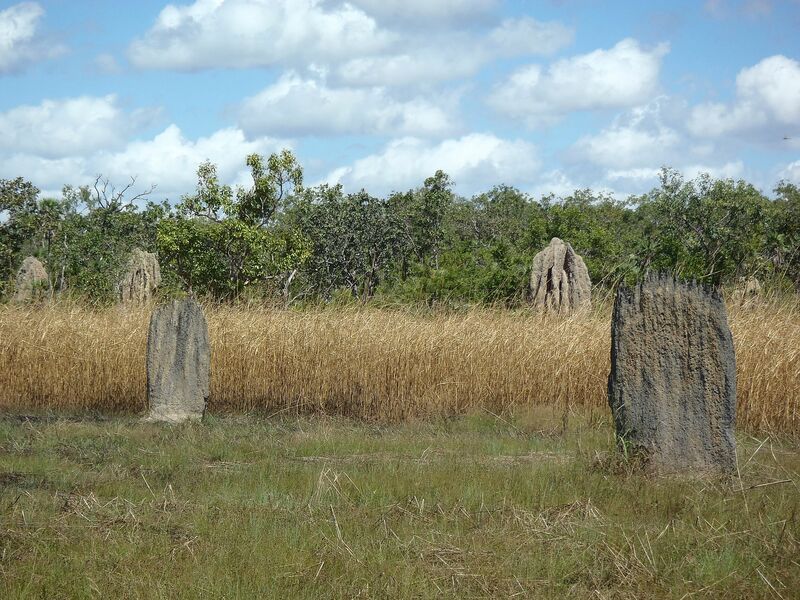 The mounds themselves are not magnetic but the question had been raised on how the blind termites were able to orient their domain to minimize their heat exposure. We read that when an experiment was performed by placing the mound in an artificial magnetic field, the termite construction crew oriented their new building to the artificial magnetic field, until it was later removed. 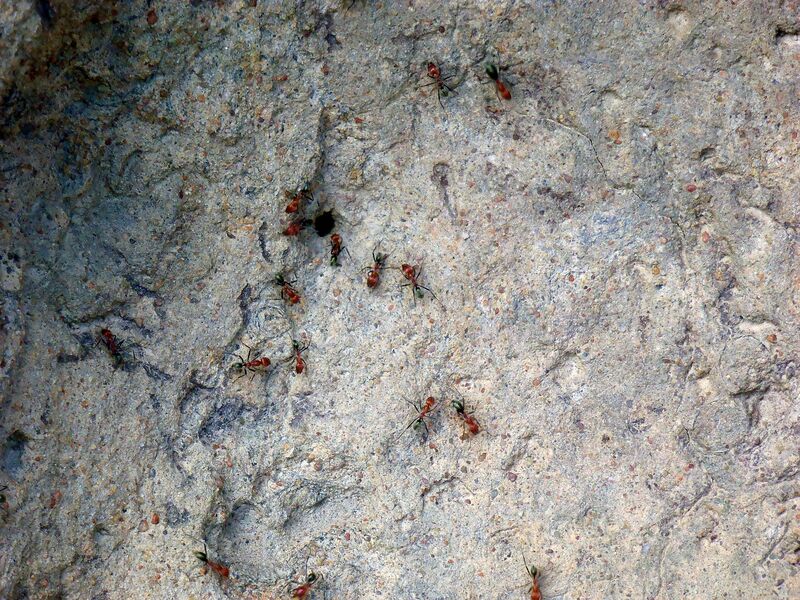 The termites themselves had some mechanism that sensed the earth’s magnetic field. I wondered if the termites corrected for the difference between magnetic north and true north but the difference is only three degrees in this part of the world and they probably think that magnetic north is close enough for termite work. We left the park but stopped for lunch in the village of Bachelor at the Butterfly Farm. Lunch was tasty and after admiring the butterflies, we fed carrots to several groups of pet bunnies. Very soothing, both for us and the bunnies. It was late afternoon when we left the Butterfly farm and as we had seen several wallabies that looked like they might have suicidal tendencies, we stopped at the Adelaide River Inn caravan park for the night. The small hamlet of Adelaide River has the third largest war cemetery on Australia. 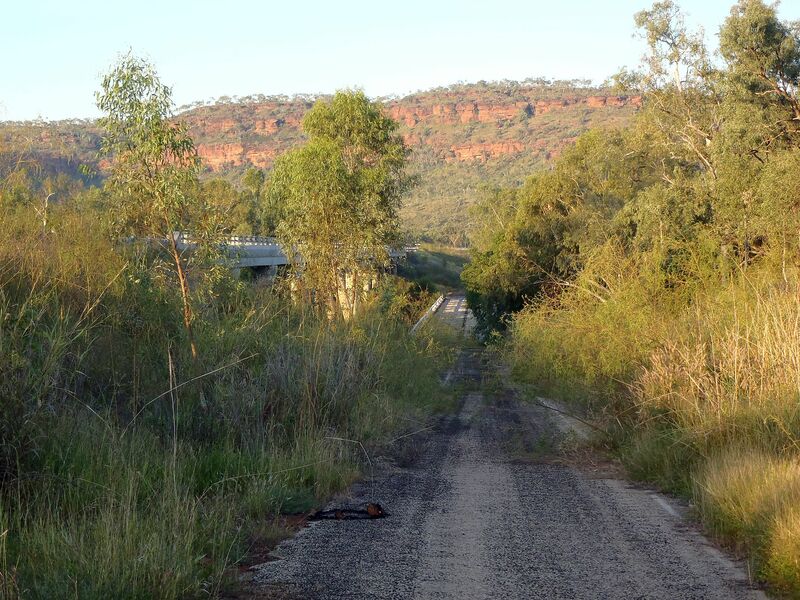 In WW II, the railway line paralleling the Stuart Highway had multiple sidings for staging or storing war materiel. 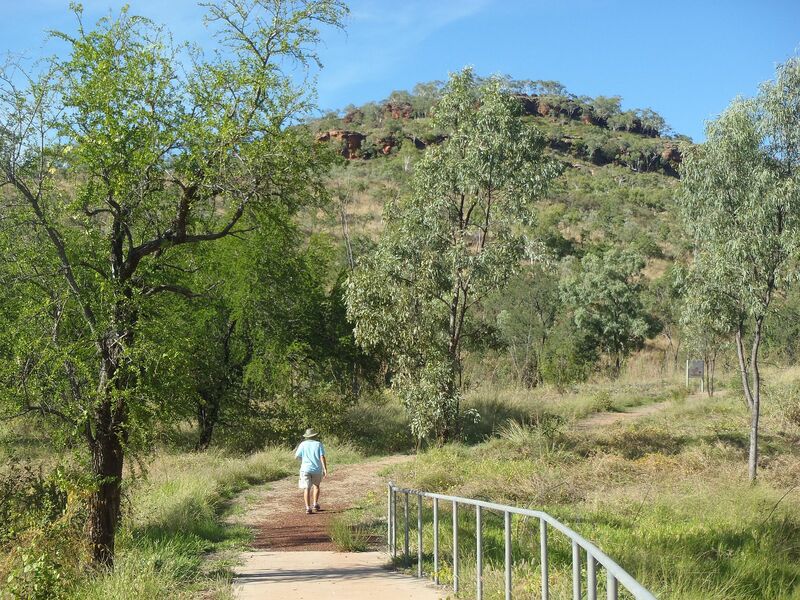 There was a large hospital here plus several nearby airfields airfields and the town was an important rear support location for the wartime port of Darwin. Tomorrow is ANZAC day in Australia and we were warned that the caravan park here would rapidly fill and there would be a huge influx of people for the remembrance ceremonies in the morrow. We decided we would chill for the day and attend the dawn service at the cemetery. For those readers unfamiliar with the term “ANZAC”, I have reproduced here what I wrote in 2008 when Annette and I visited the site of the Gallipoli landings. In January 1915 the "Great War" that had begun in August of the previous year had now morphed into a horrific stalemate, where millions of soldiers faced each other across networks of trenches that ran in a band across France from the Swiss border to the Atlantic Ocean. The casualties on both sides were enormous and immense battles produced virtually no movement of the battlefield. Winston Churchill was Lord of the Admiralty, a civilian post as head of the British Navy and reporting to him was a "Sea Lord", Lord Fisher, essentially the top military position in the Navy. Fisher had suggested to Churchill that the Dardanelle Straits in Turkey could be forced by battleships. This would cause the fall of Constantinople, thereby severing Turkey from the war and allow an attack on Germany via the "soft underbelly" of Europe through the Balkans. Strategically it was a good plan and almost succeeded. It was defeated, as many attempts in wartime are, by inept "peacetime" military officers. The original plan was to use the firepower of the great battleships to outrange the Turkish forts guarding the straits and systematically destroy them. The risk of mines was well known but the attack was to be accompanied by mine-sweeping ships and the loss of several older battleships was to be expected. Although the battleships could operate out of range of the Turkish guns, the mine-sweeping trawlers could not and the civilian crews aboard did not like being shelled. By the time the crews had been swapped for military crews, much time and the element of surprise was lost. Two older battleships hit mines and the Admirals lost their nerve and cut and run. They decided that they needed ground-troops to remove the Turkish forts. As the generals cast around for troops to use, it happened that the first contingent of volunteers from Australia and New Zealand (formed into a single contingent - the Australia, New Zealand Army Corp or ANZAC) was passing through the Suez Canal on their way to the battlefields in France. The Anzacs were selected, together with other contingents, to make an a beach landing on the west side of the narrow Gallipoli Peninsula (the forts were on the other side of the peninsula). On 25th. April 1915, the Navy dropped the troops in the wrong place and the Anzacs found themselves on an exposed beach, as easy targets for Turkish soldiers shooting down at them from the steep hillsides. Even when a second landing was made, the British commanders had no sense of urgency about establishing and breaking out of a beachhead. The troops reconnoitered inland and then headed back to the beach to brew up tea. The next time they patrolled in that direction, they found a barrier of entrenched Turkish troops with barbed wire entanglements and machine guns. The same stalemate of trench warfare that existed in France, now existed on the Gallipoli peninsula. Over the next 9 months there were more than half of a million casualties with 36,000 British deaths, 47,000 French deaths and 55,000 Turkish deaths. The Gallipoli campaign was abandoned in January of 1916. This morning, 5:00 a.m. found us walking in total darkness to the war cemetery about a mile from the caravan park. Ahead and behind us in the darkness was a string of other walkers and on our left, a bumper to bumper line of vehicles, SUV’s, “Utes” and motorcycles, all bound for the same destination. The service began before dawn with various dignitaries laying wreaths at the foot of a large cross and then there was a long list of small organizations, volunteer firefighters, small businesses plus individual families who laid wreathes. As the darkness slowly lifted and dawn approached, we could see that there were more than a thousand attendees at the ceremony. It was particularly moving to see that this is very much a local and community affair. In America we don’t have anything like this. We usually have one or two politicians, who have scrupulously avoided military service, making the usual bland speech in front of the TV cameras on Memorial Day but America does not honor its war veterans at the level that Australia does. capita than any other country on earth, "Two Up" is illegal. It is "de-criminalized" on a single day per year - ANZAC day. I expect that the reason this game is so morally sapping and needs to be banned is that unlike the "pokies" (slot machines), the government doesn't get a cut of the "Two Up" revenues. We continued south this morning on the road to Katherine and spotted two large wallabies that fortunately ran away from us. Katherine is the last sizeable town we will see for a few days thus we stocked up on a few groceries, topped up the diesel tank and filled one of the spare cans. Although fuel is available on the next section of highway, experience has taught us that the remote roadhouses can be pricey. 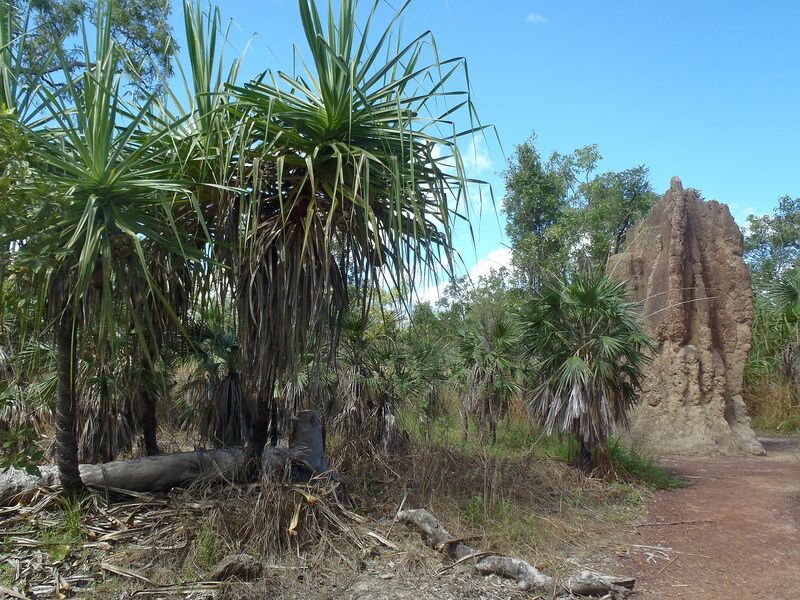 We turned west from Katherine, back on the Savannah Way and the terrain was noticeably different. Rolling hills with rocky outcrops, boulders and hardrock cuttings through the ridges that the road had been driven through. The temperature and humidity were both lower as we headed into drier country. We stopped for the day at Victoria River Roadhouse. The main building bore a large sign stating that the establishment was “Under New Management” and superimposed upon this was another sign bearing the word “Wife”. Whether this meant that the previous owner had a new wife or that the the wife of the new owner was in fact managing the roadhouse remained unresolved. 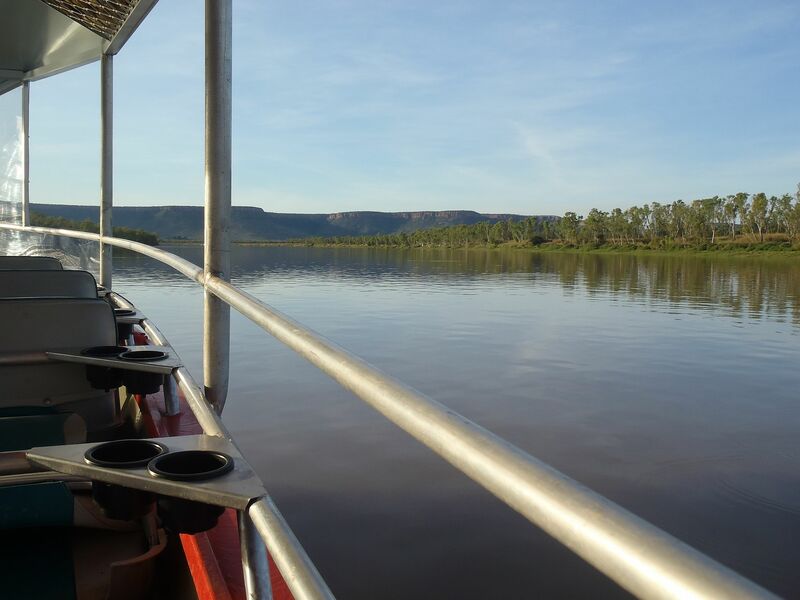 We paid for a powered site in the caravan park and discovered that the tours of the Victoria River had been operated by the previous owner and were no longer available. The lady who checked us in suggested a walk across the river on the “old bridge”. We were cautioned not to approach the water because of the crocs. Not a lot to do so we grabbed a couple of beers and headed down to the bridge. The “old” bridge looked to be in fine condition, about thirty feet above the river. The “new” bridge runs close by, parallel and is perhaps another twenty feet higher. 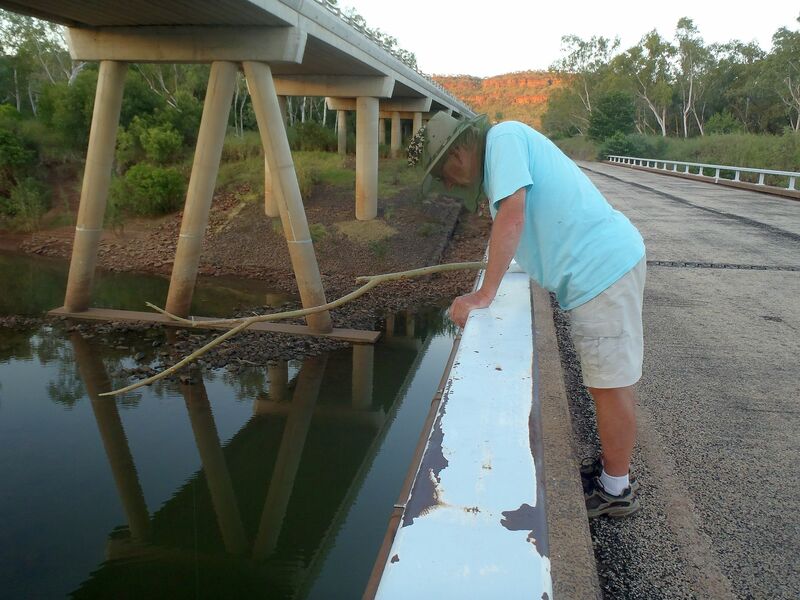 We wandered over the bridge, scanning the waters below for crocs, the banks for tell tale “slides” and saw nothing. The river was running slow and shallow and with lots of sharp rocks. Not really the place for crocodiles. 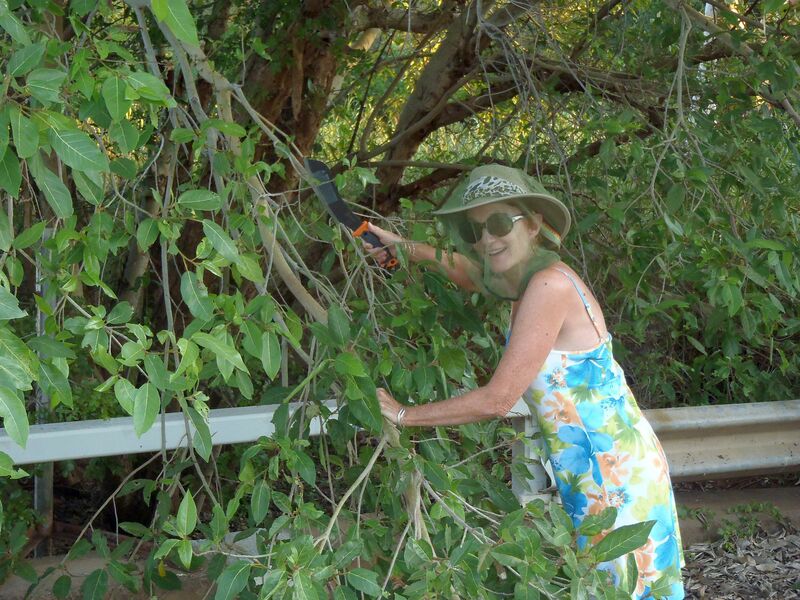 As we headed back for the camp, Annette found a jumble of discarded fishing line in the gutter of the abandoned roadway. “Do you think this would reach the river?” she asked. I assured her that it would and as we both worked to untangle it, I queried what she intended to do with it. 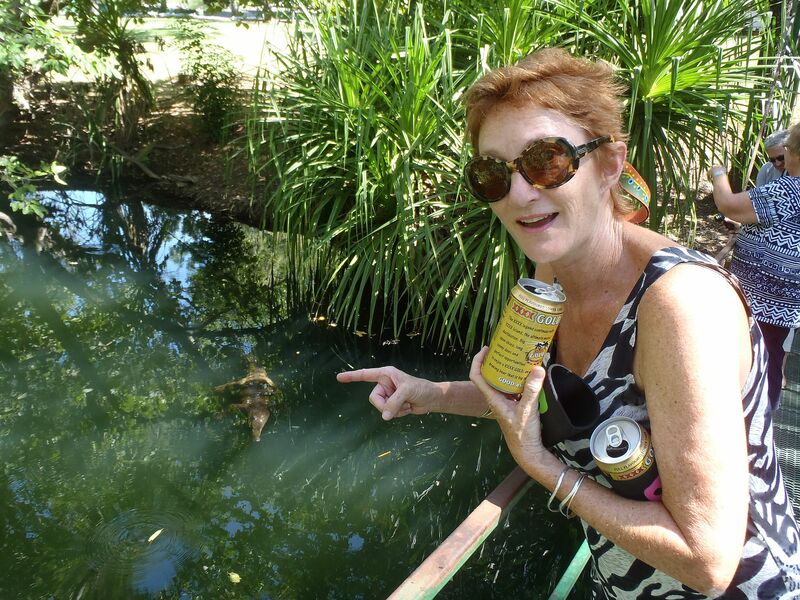 She said she wanted to flop the empty beer cans into the river and see if she could attract a crocodile. A futile exercise but since we had nothing pressing at that moment, we untangled the line, attached both beer cans and dangled it to the river. The cans just touched the surface if I leaned below the guard rail. She didn’t like that and tore a branch from an overhanging tree that soon became a rough pole. 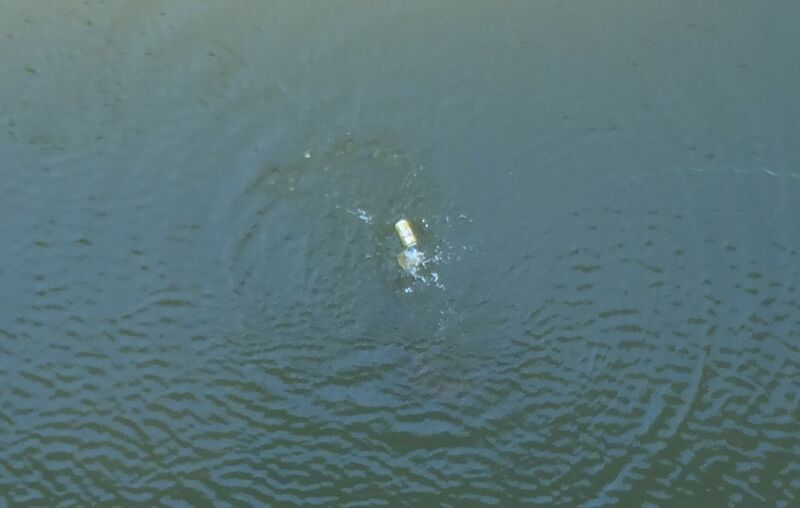 She then began flopping the cans onto the surface of the river below the bridge. 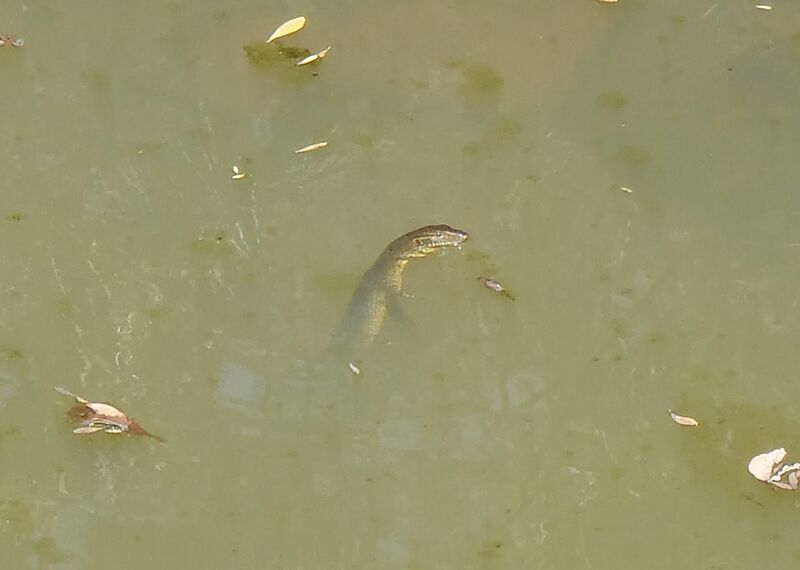 In less than thirty seconds, a five foot, fresh water crocodile appeared from nowhere and swam towards the cans. Neither of us really believed that this was going to work, so the camera was laying nearby on the ground. Annette was yelling for me to take a picture and I was struggling to get the blasted thing turned on. The croc nipped at the cans and then disappeared again. Rats! A few seconds later, it came vertically from below the cans, bit them and took them down. Wow! I managed to get one picture from above of the jaws closing and then they were gone. Apparently crocs don’t eat empty beer cans, ‘cos they popped back to the surface almost immediately. 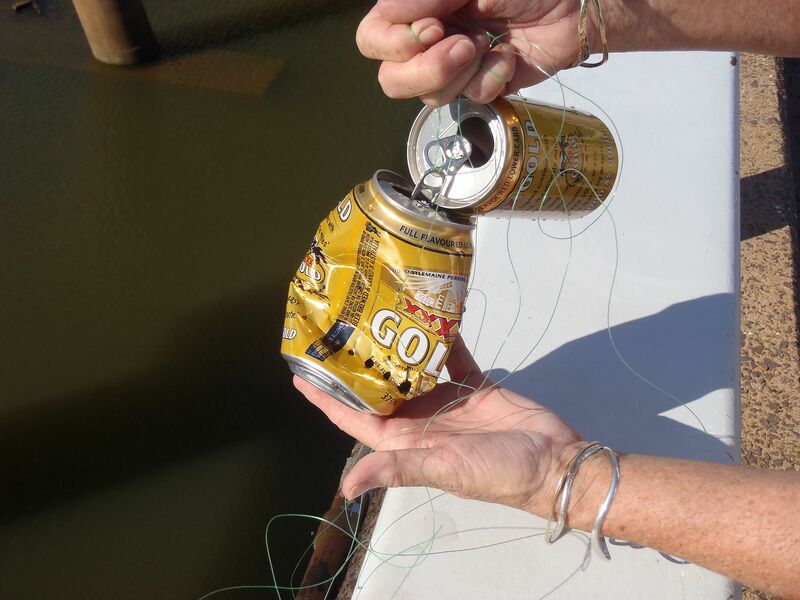 We “rescued” the cans and found that one of them has two sets of bite marks and was squashed near flat. This particular trophy we will carefully transport back to the USA to remind us that innocent looking rivers really aren’t. This morning was the first cool morning we have experienced in a while. The ochre rocks of the escarpment behind us glowed like hot coals as the rays of the sun peaked over the horizon. We headed down the highway for a couple of kilometers before parking at a trailhead and hiking a trail to the summit of the rocks we had admired earlier. 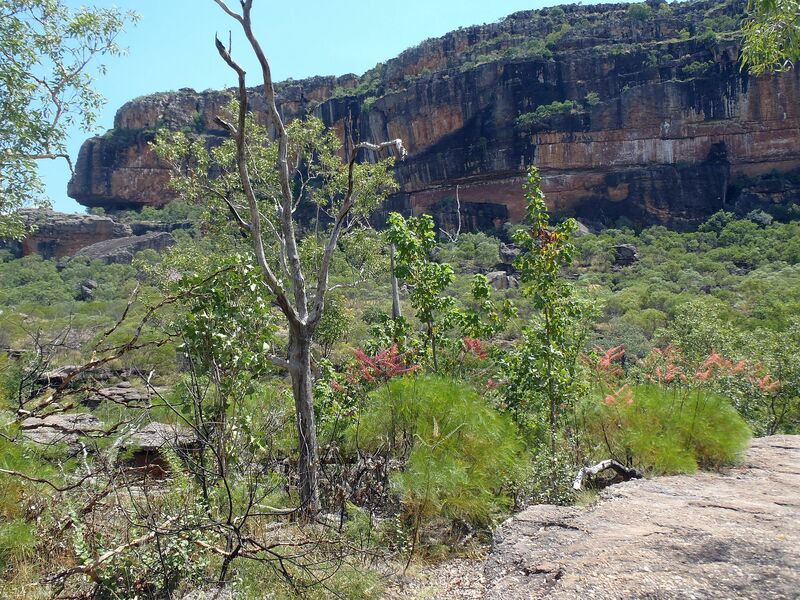 The trail curved up the steep slopes and gave great views of the Victoria River basin laying below us. In the distance we could see the cleared river meadows surrounding the Roadhouse where we stayed last night and no other buildings or sign of human presence as far as the eye could see. What an amazing country this is. The Victoria River, full of fresh water and crocodiles, lazily wound its way to the northwest, towards the Joseph Bonaparte Gulf. The trail cut through several narrow defiles and to our sides we could see where similar defiles had become chimneys during a recent brush fire and the rocks had been scorched by the passage of intense heat. From the summit, the view of the ridges and mesas on either side of the river reminded me a little of the Glorieta Pass in Northern, New Mexico. I gravely pointed out to Annette where the Union cavalry had hidden and where the Confederate artillery and baggage train had been placed but she didn’t believe a word of it. 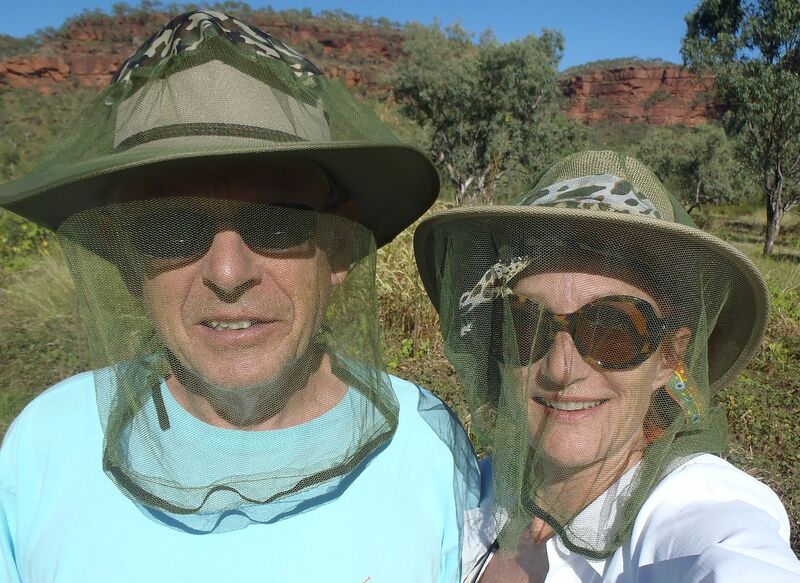 On our return downhill hike, Annette discovered that she had picked up three kangaroo ticks as hitchhikers. I scoured my body looking for similar livestock but found none. This didn’t stop me from itching for the next hour of course. The highway followed the course of the river and we stopped at Timber Creek in early afternoon. We booked a sunset river boat tour and believed we would cool off in the swimming pool for a couple of hours before our tour. Thanks to my upbringing in cooler climes, (plus a larger supply of body fat) I was able to enter the water but Annette couldn’t get more than her legs wet. It was too cold for my tropical princess! The boat tour took us some 35 kms (22 miles) down stream and the Victoria River is very much tidal, providing habitat for both “freshies” and “salties”. We departed just after high tide and so the mud flats where we might see basking estuarine crocodiles were all submerged. 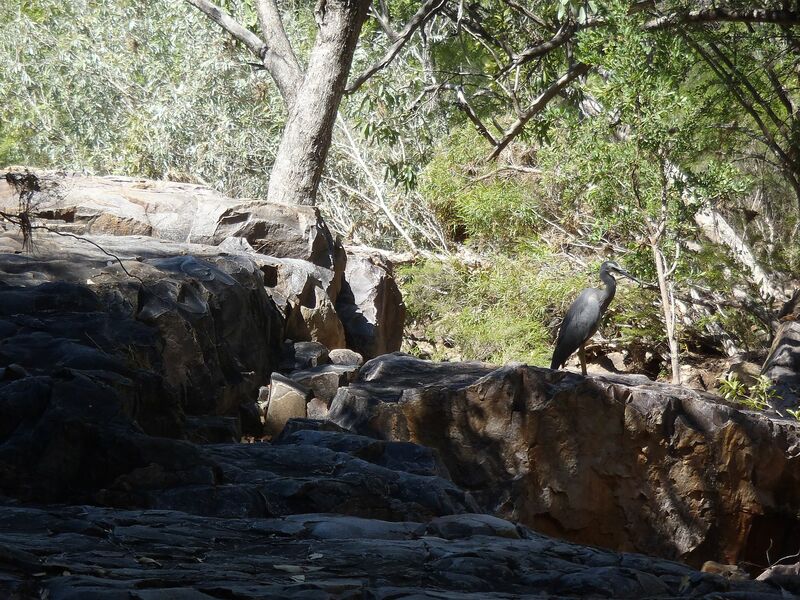 We saw lots of wallabies on the banks as evening approached. The wallabies would approach the water’s edge in order to drink from the Victoria River and thus they provided the primary diet of the salt water crocs. 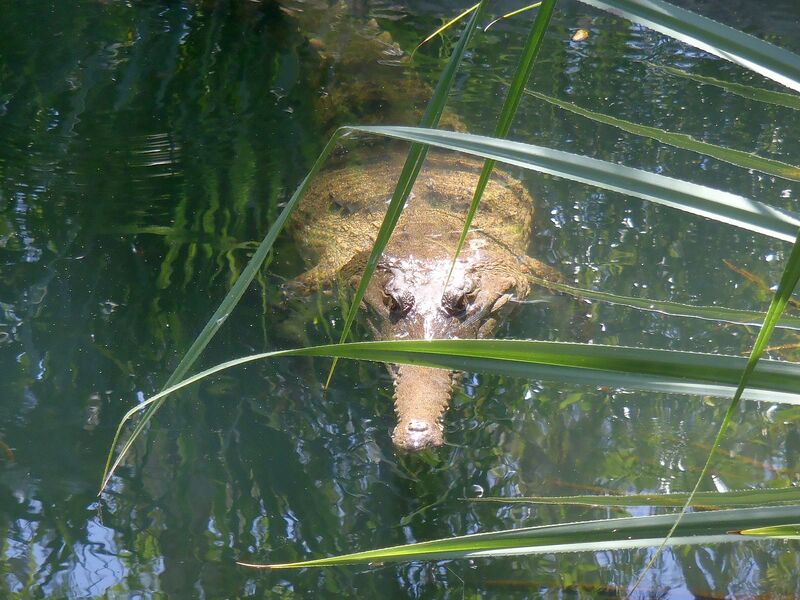 We did see several “small” four or five foot long fresh water crocs, as well as salt water crocs. The “freshies” were generally spotted on the banks whereas all of the “salties” were in the water. 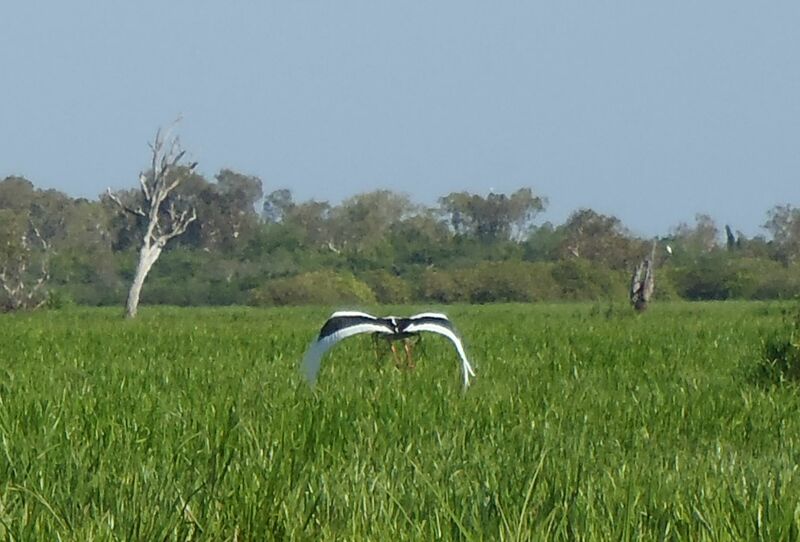 We passed colonies of white cockatoos, egrets, a Brolga crane, plus lots of whistling kites and “sea eagles” or ospreys. 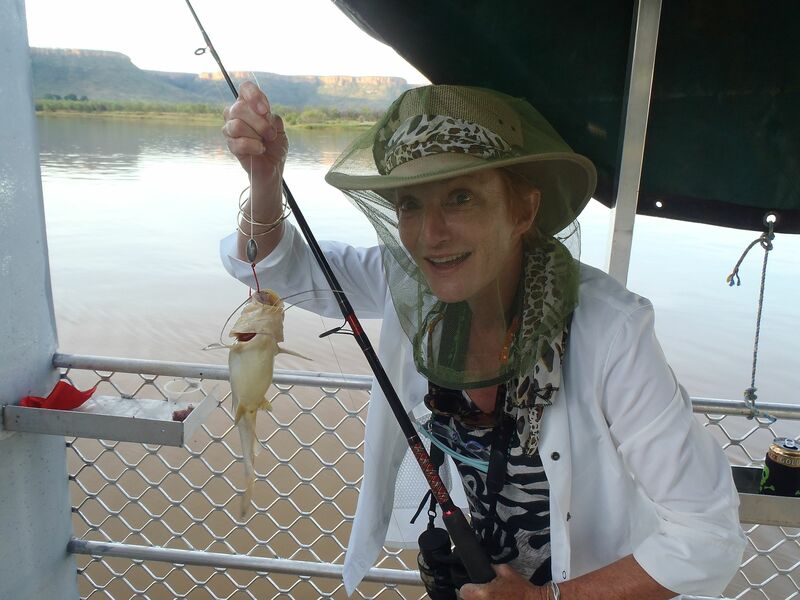 At our turnaround point both our guide and Annette fished for catfish and both were successful. 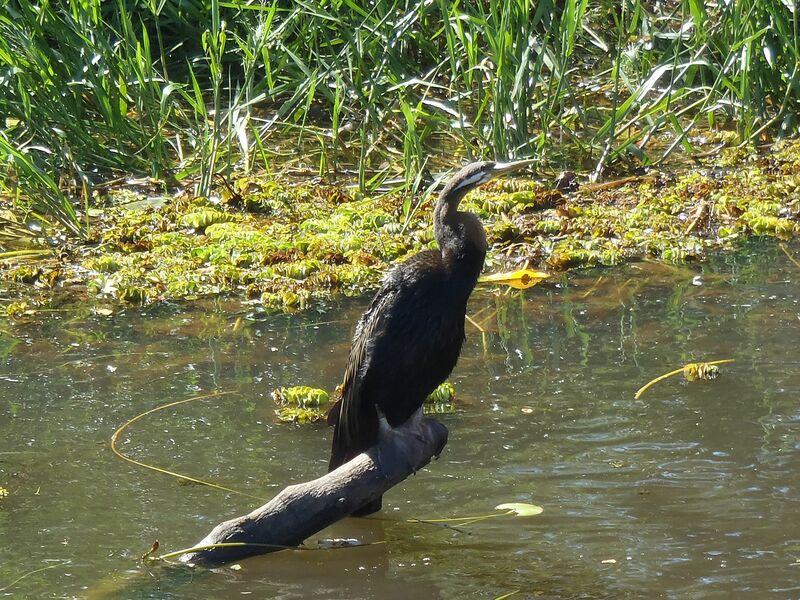 The catfish were proffered to a large eagle who flew from the bank and snatched the fish from a small platform extended from the boat. 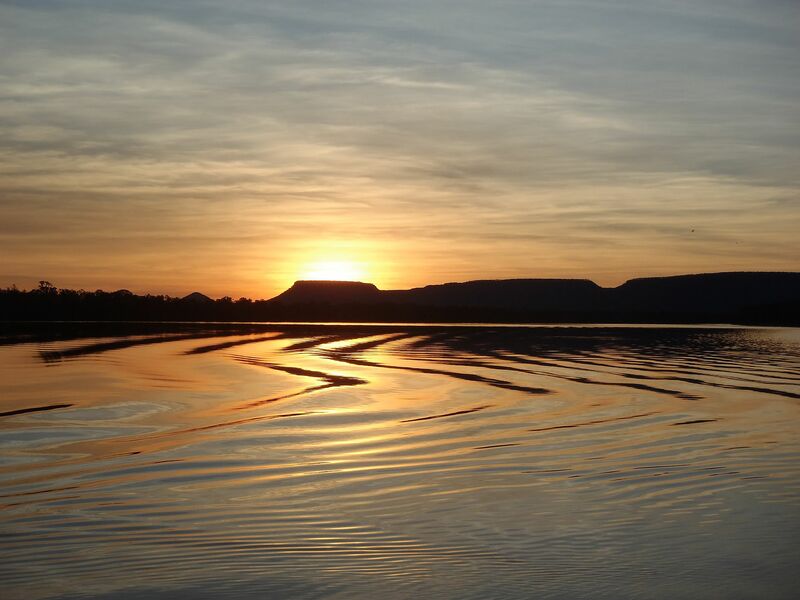 Dusk was now upon us and with the sun setting behind a series of small mesas forming a bend in the river, the fiery glow silhouetted the landscape and reflected in the broad stillness of the river. Our return to the dock was in near total darkness and the single light at the boat ramp was the first glimmer we had seen on 35 kilometers of river. A good tour and a good day. During the first half of the drive to the border with Western Australia, the haze of smoke from brush fires hung low on the horizon. We assumed that these fires had been deliberately set to clear brush but we saw neither the pyromaniacs nor any monitors to control the spread. 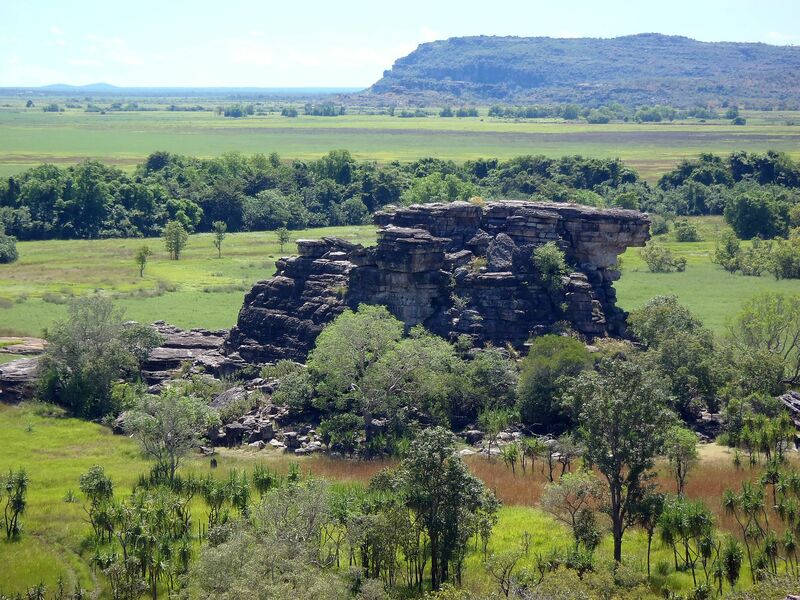 The road continued to follow the course of the Victoria river and the escarpments on either side of the river became higher and more rugged. A band of rock forming a vertical cliff face that was near blood red, provided a dramatic obstacle about one third of the elevation below the summits. 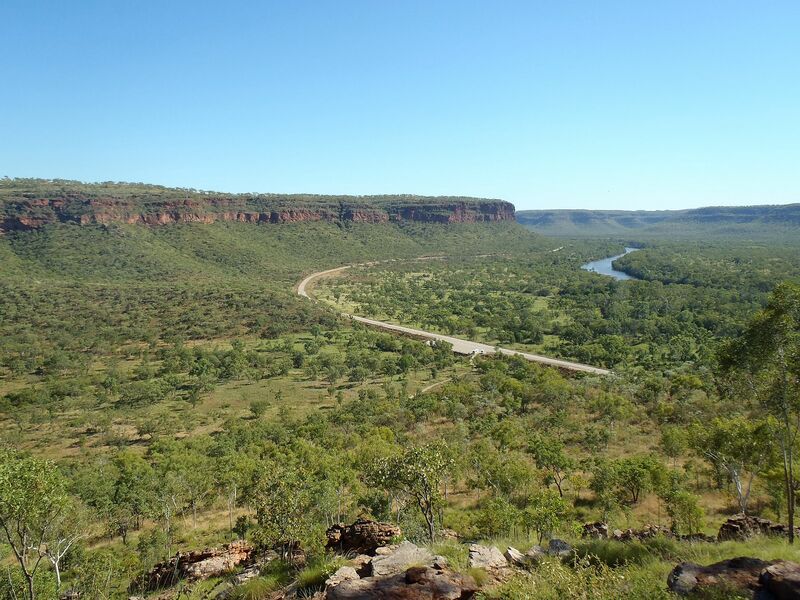 On either side of the road we would drive from fairly dense bush, to Savannah and then to near treeless grass plains. 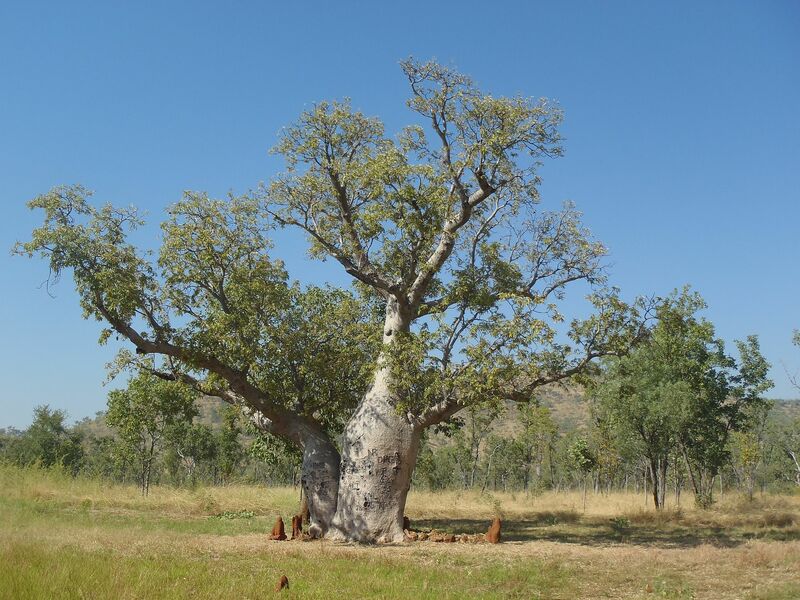 The stretches of Savannah were punctuated by sprinklings of “bottle” or Boab trees. 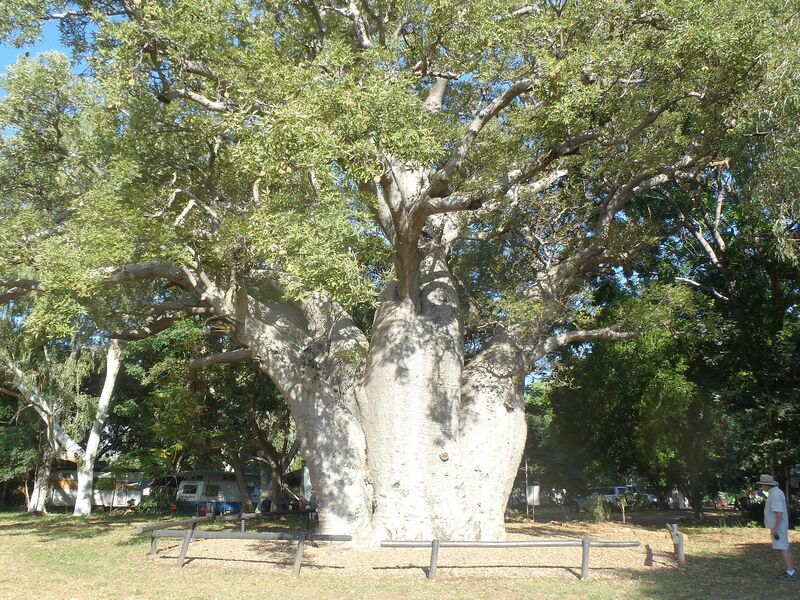 Their great girth and grey bark made me think of elephants grazing. 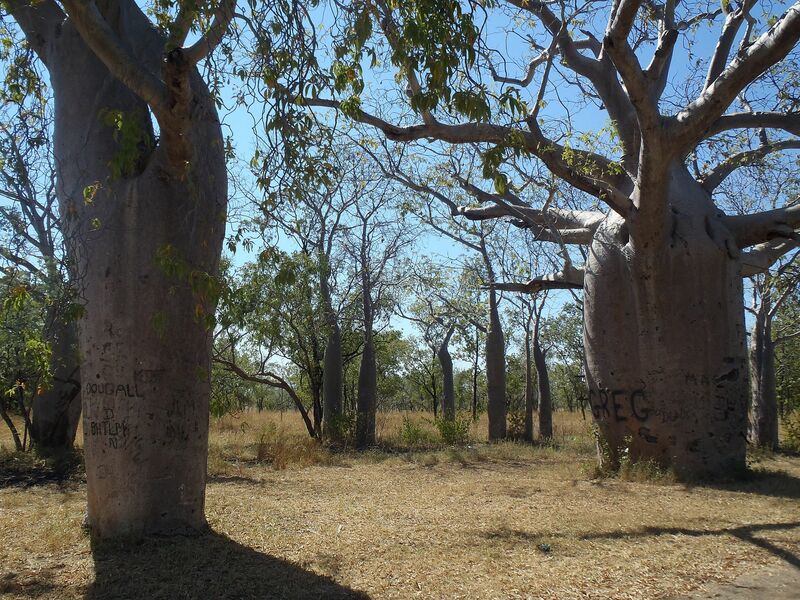 These trees are so striking and have been a frequent target of vandals over the centuries, who have carved their forgettable graffiti into the thick bark. We overcame the temptation to photograph every one and pressed on to the west. A sign indicating a “Zebra Stone” mine caused us to divert some 24 kms. 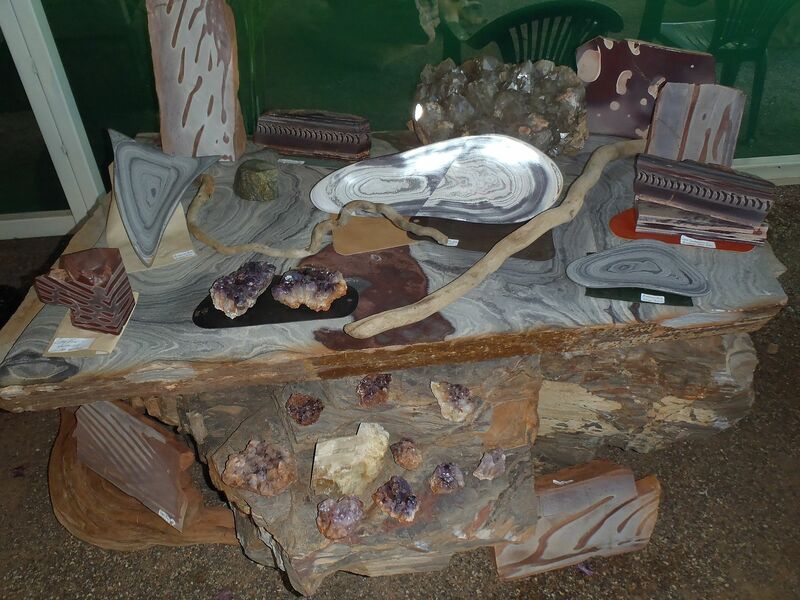 on a dirt road and we visited the homestead of Kim and Ruth Duncan, where we viewed an exotic array of minerals, some polished and some raw. They had slabs of stone cut and polished for tabletops and weighing more than a ton. Bit of a problem as carry-on baggage for a flight to the USA. 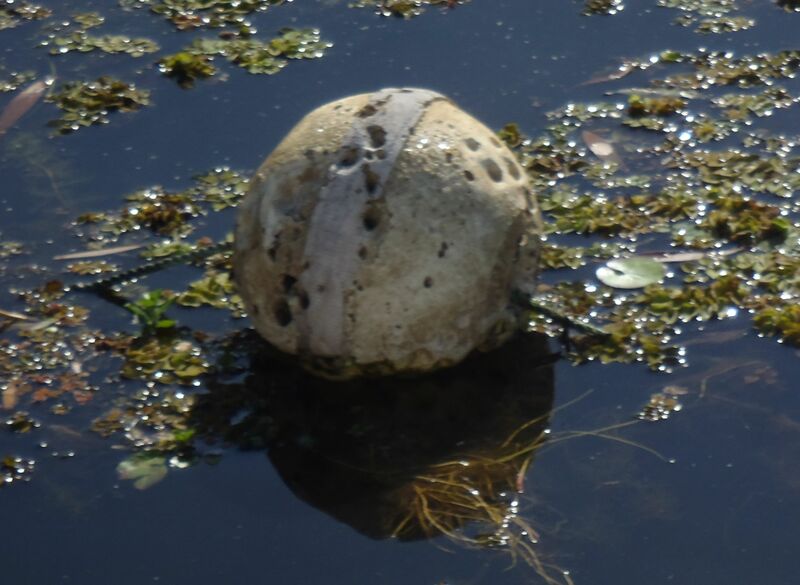 Annette found bowling ball sized “moon-stones” from Hughendon that she had been lusting over. Perhaps one third of these curious artifacts contain in their centers a large fossil – but you have to break the stone to find it. 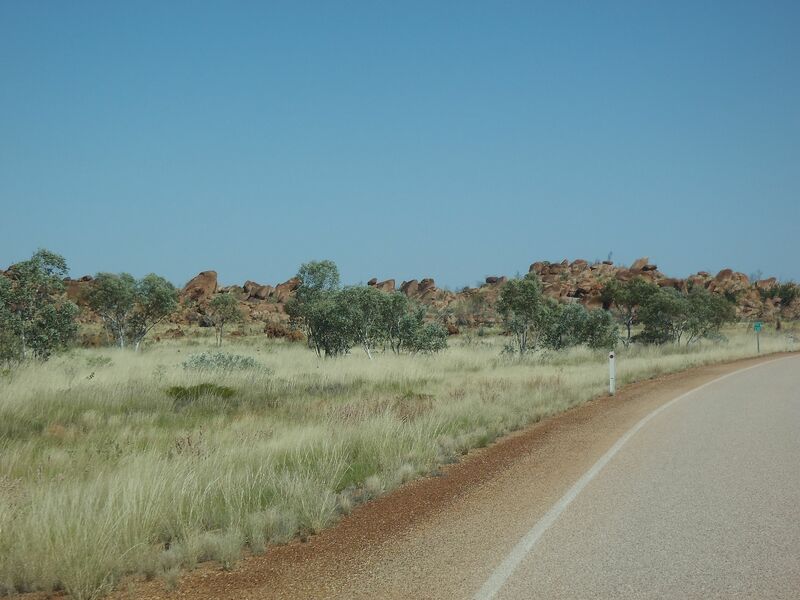 Next stop was an agricultural inspection at the State border and after checking our refrigerator for contraband, we were waved onwards into Western Australia with multiple signs warning of us of a 90 minute time change from the Northern Territory. I remarked to Annette that this is the first border crossing in more than a decade, when we weren’t carrying some kind of contraband (such as apples or sea-shells – what did you think I meant!?) We must be mellowing. 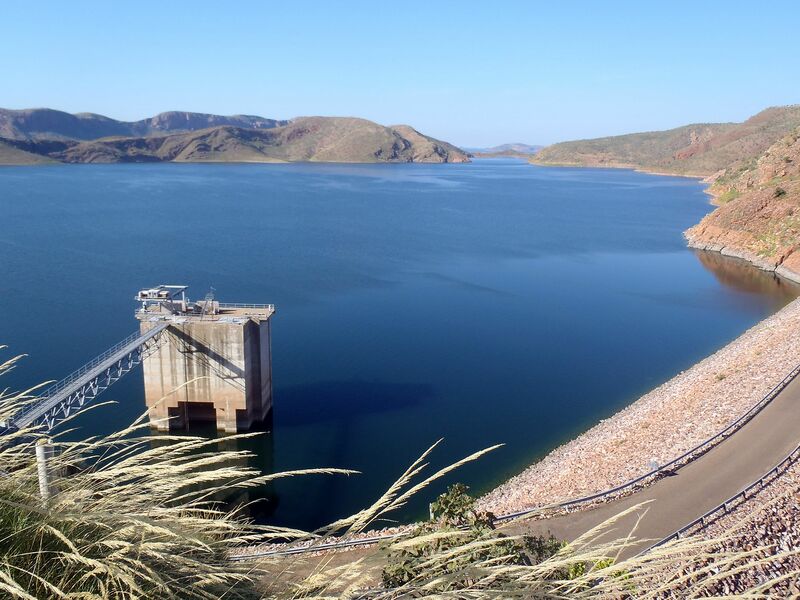 Our destination for today was Lake Argyle, Australia’s largest man-made fresh water lake, created by damming the Ord River amid the rugged gorges of the Carr Boyd Ranges. We drove through spectacular rocky outcrops on the road in to the resort, arriving at the lakeshore in early afternoon. 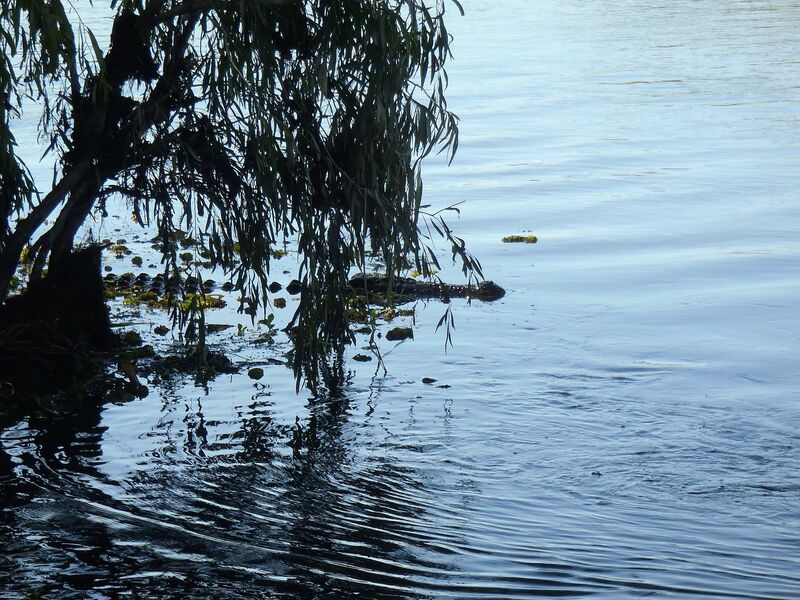 The lake is home to thousands of fresh water crocodiles and although we were assured that they only attack humans “by accident”, we ignored the intelligence of “safe” areas to swim, such as “adjacent to the boat ramp” and determined to use the resort swimming pool instead. 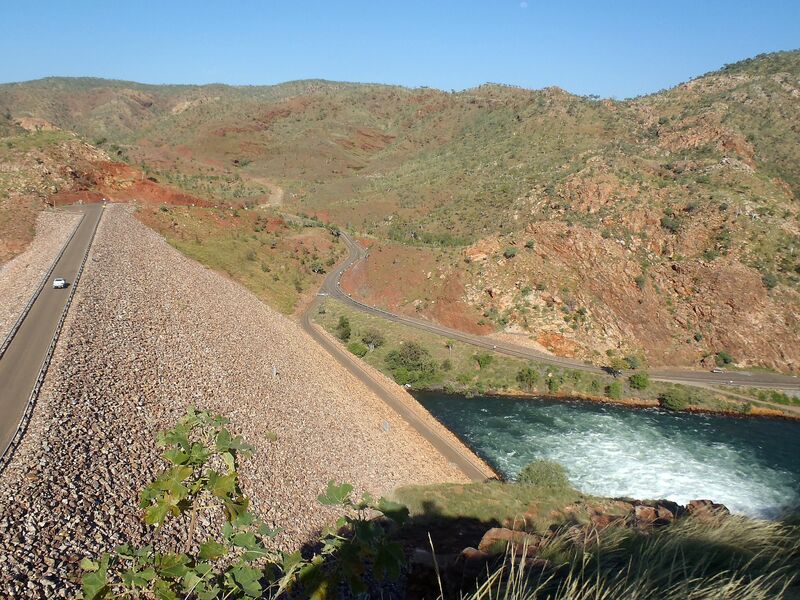 This morning we toured the dam overlooks and outfalls before driving onwards to the town of Kununnura. It was early in the day and we decided to continue to Wyndham, the most northerly town in Western Australia. We were stopped in our headlong rush to the north by a fading sign bearing the single word “Gorge”. We followed the sealed road for several kilometers until it terminated in a parking lot. 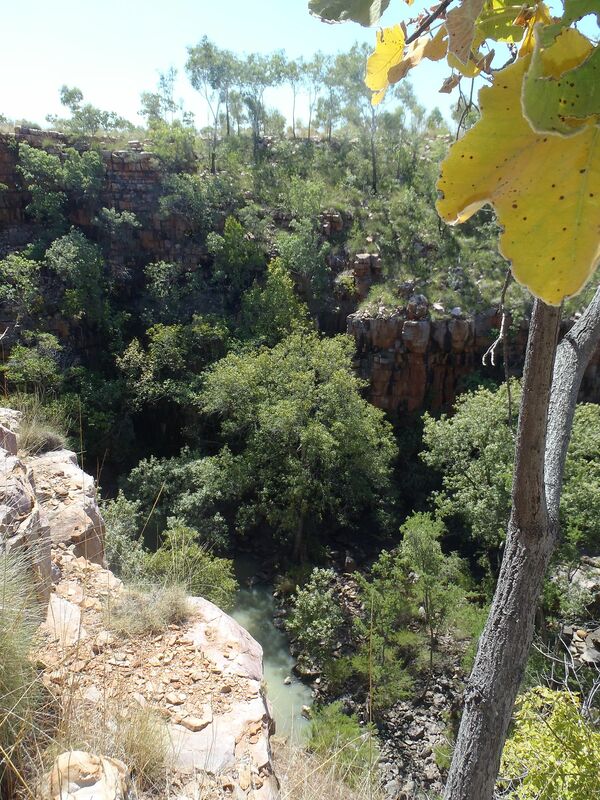 A sign indicated that beyond was a trail descending into a gorge via a hundred plus steps and that it was dangerous to jump or dive into the pool. The sign did not mention crocodiles and so we loaded backpacks with swim suits and beer and headed for the cliff’s edge. 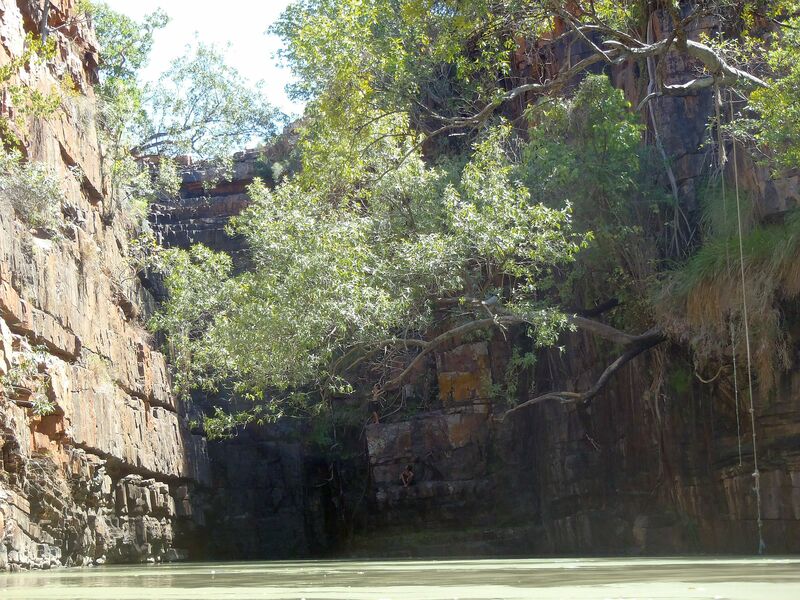 The gorge appeared as a slash in the earth as though the rocks had been quarried, with vertical cliffs ringing a pool of green water way below. Someone had made a huge effort to cement large stones into a tortuous winding staircase down the cliff face. I kept expecting to meet Gollum, Frodo and Sam crawling upwards as we descended. The base of the cliffs were a jumble of broken rock showing where portions of the overhanging cliff face we had just descended, had broken away and crashed to the spring fed pool below. 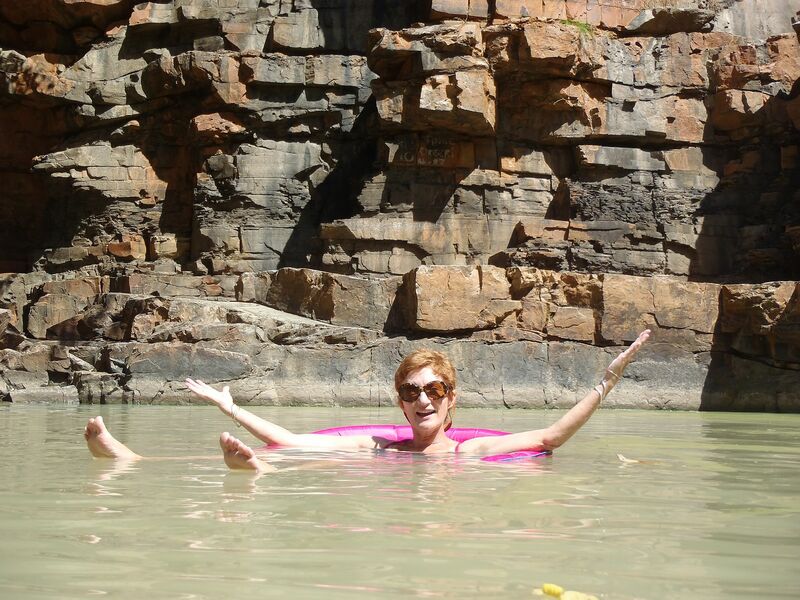 We gingerly made our way over the slimy rocks at the waters edge and eased into the coolness of a still pool of water. There were two young Japanese lads at the far end of the pool and when we asked where they were from, they answered with a heavily accented, “California”, followed by peals of laughter. Annette remarked to the lads, in Japanese of course, “This is very cold, isn’t it?” They agreed and their loud chatter ceased at that point. Wyndham is a port on the Cambridge Gulf where ore ships are loaded for export to China. 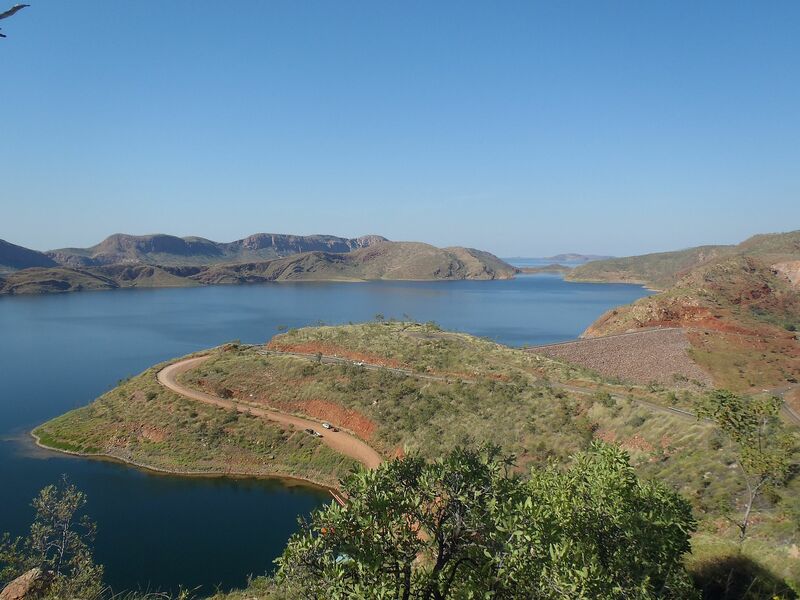 This town was the port of access for the 1886 gold rush at Halls Creek when there might have been 16 vessels moored at the dock, a far cry from the hot, dusty, abandoned looking town of today. Of course the town is hardly abandoned, as there was a steady stream of ore laden “four trailer” road trains, to and from the loading dock. Our destination was the crocodile farm, located just beyond the port facilities. When we arrived, there was a large and brightly colored sign proclaiming, “Open Every Day”, with a small sticker superimposed, stating, “Closed”. Never mind, there was an art gallery nearby specializing in aboriginal art and we headed over to investigate. Also closed – the proprietor was, “out of town”. The museum also bore a “closed” sign but a lady walked across the street, asked if we wanted to see the facility and proceeded to unlock the door for us. This was a wonderful museum, crammed full of photographs, artifacts, documents and the like, covering all facets of the development of this outback port. 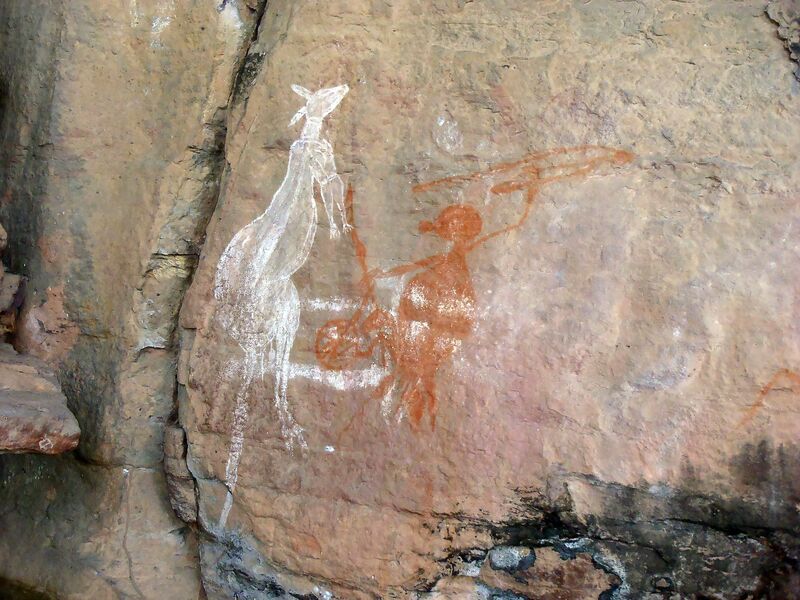 There were sections on camels plus their Afghan camel herders, Chinese workers, aboriginal artifacts, telegraph, medical and dental tools, crocodile skins, fossils....the list is almost endless. We were really pleased that we got to see this. 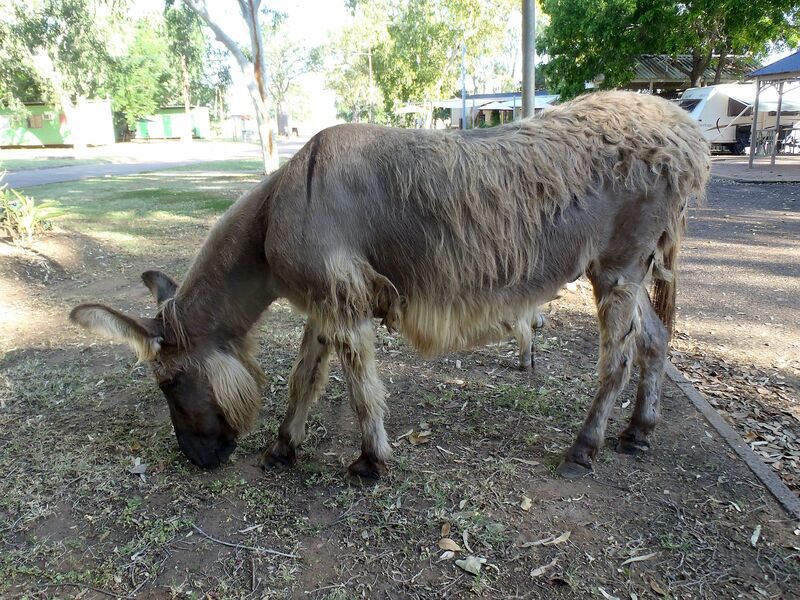 The caravan park we stayed at for the night boasted the largest bottle tree in Western Australia but for Annette an even bigger attraction was “fuzzy” a free range donkey that roamed that park at will. “Fuzzy” was huge and well...fuzzy. The park manager told me that he had been a feature of the park for over 25 years. We would have given him a carrot but had been deprived of all suitable donkey-feeding fruits and vegetables at the border crossing. Wyndham boasts having the highest temperatures in Australia and we did not dispute this claim as we drove south past the 20 meter (66 feet) concrete and wire statue of a crocodile that guards the town’s approach. 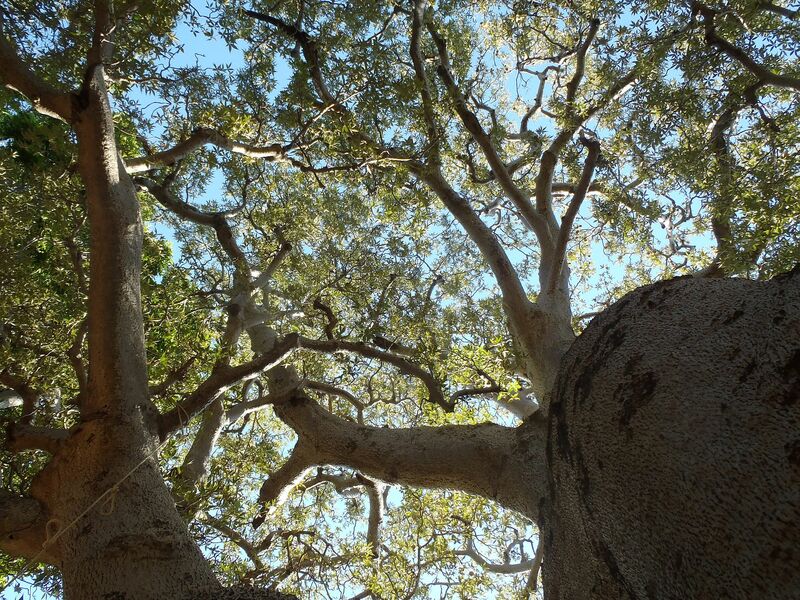 We stopped in the town of Warmun to visit the aboriginal art gallery that is located within the community and were surprised to find the modern facility being operated by two Sydney art school graduates of European descent. 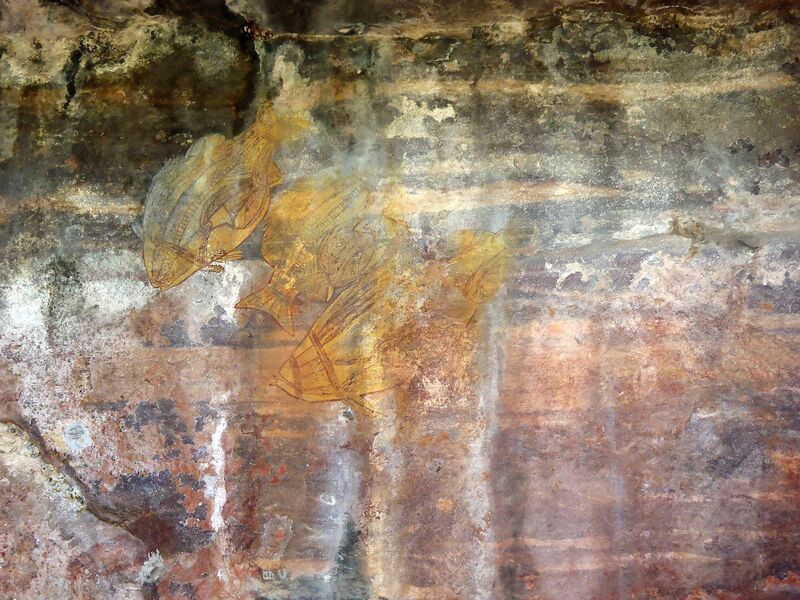 The art was mainly “contemporary” style and Annette prefers the more traditional aboriginal styles. In addition there was no pricing displayed, no biographies of the artists nor details of the provenance of the various pieces. Annette was instead offered a “personal tour” of the gallery but felt uncomfortable with this style of salesmanship. We moved on. Our next stop was the Bungle Bungle caravan park. 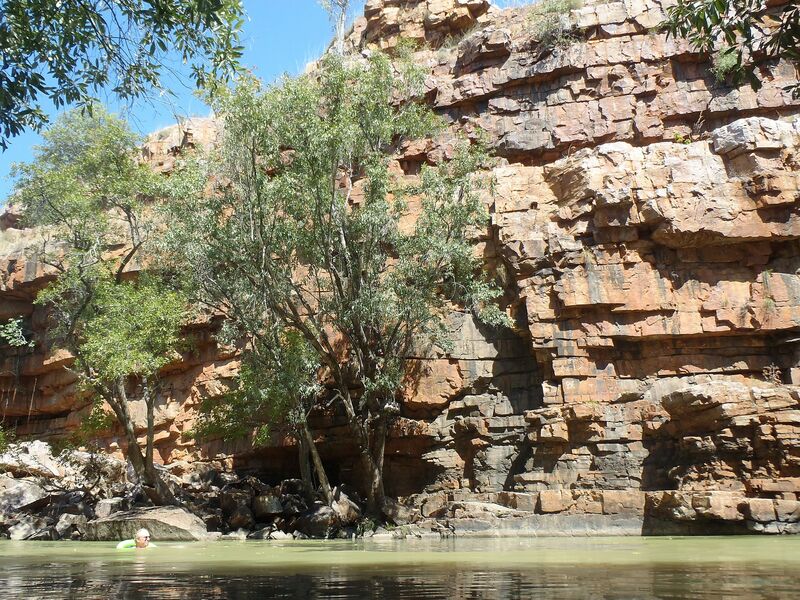 We had seen glossy brochures of the tours of the Bungle Bungle range within the Purnululu National Park, offered by the caravan park’s operator but no prices were listed. We were interested in their advertised day trip into the park by 10 passenger 4WD bus. The National Park itself lies some 50 kms (30 miles) from the caravan park and we were told that 4WD was needed on the access road. The quoted price for the day tour was $250 each, about the same price as a Greyhound bus ticket from New York to Los Angeles. We could stay overnight at the park for an additional $45, for a site that lacked e-mail or internet access. There was no attempt to sell the tour to us with descriptions of what was included, what we would see etc. just a flat price quote. We declined both offers and moved on, noting that some 5 kms. further down the Northern Highway was “free” camping. As we have moved south, we have noticed less humidity in the air although it has remained hot during the day. 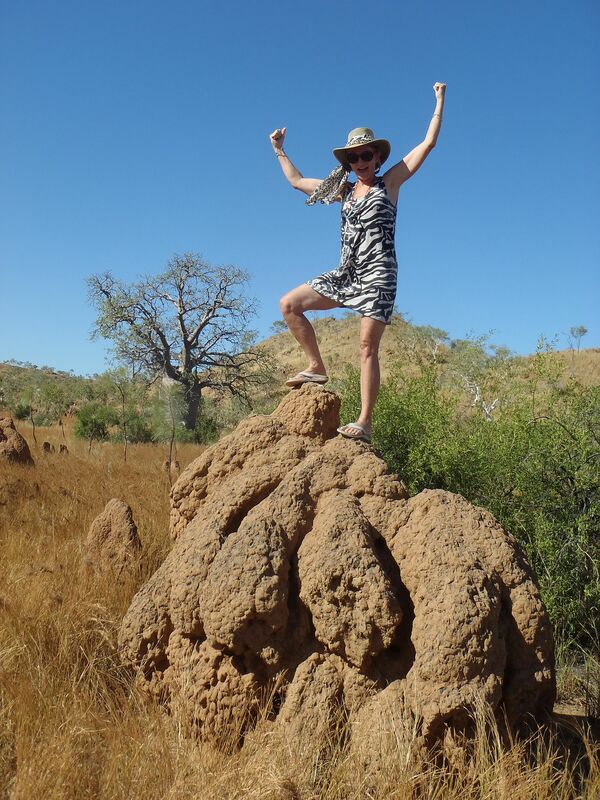 We stopped so that Annette could have a picture of herself, standing atop a large termite mound with a Boab tree in the background. What the photograph will not show is the stench of the dead cow that that lay perhaps thirty feet away. 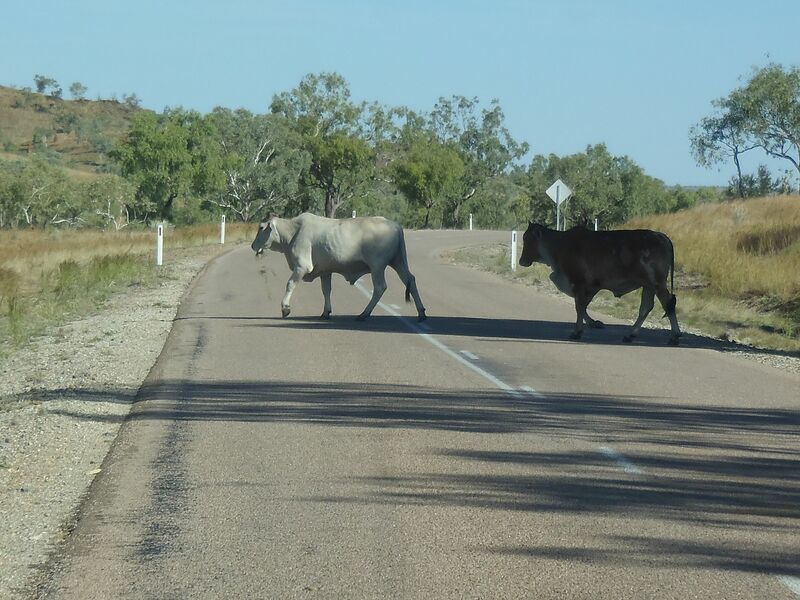 We have passed four or five	such “road-kill” cows, plus large and very dead kangaroos, rather than the smaller wallabies. We assumed that these have all been killed by “road-trains”, since collision with any of the corpses we have seen would likely have totaled an automobile. We stopped for the night at the town of Halls Creek, beginning with the information center. The girl working there warned us that Western Australia is very expensive and the Bungle Bungle tour we had earlier dissed, was likely one of the cheaper options. This was confirmed when we stopped by the local “bottle shop” (liquor store) that local ordinance mandated to sell “light” beer only - no wines or spirits. We had purchased a 36 can case of beer a few days ago at $40 and this liquor store charged $55 for a case of 24 cans, more than double the previous price.